1998-01-23 Application filed by 파라곤 인텔렉츄얼 프라퍼티즈 엘엘씨. filed Critical 파라곤 인텔렉츄얼 프라퍼티즈 엘엘씨. 본 발명은 양방향 안정형 유니트 셀과, 이를 특히 스텐트, 클램프, 밸브 등의 의료용 장치 등의 장치에 사용하는 것에 관한 것이다. The present invention relates to the use of the device, such as a medical device, such as a bi-directional unit cell and stable, in particular stents, clamps, valves. 복수개의 양방향 안정형 셀로 형성된 확장형 스텐트가 개시되어 있다. A plurality of two-way stable cell formed expandable stent is disclosed. 상기 스텐트는 제 1 직경을 갖는 제 1 안정 형상과, 제 1 직경 보다 더 큰 제 2 직경을 갖는 제 2 안정 형상을 포함하는 둘 이상의 안정 형상을 갖는다. The stent has more than one stable shape to a second stabilized shape to the first stabilized shape having a first diameter, having a greater second diameter than the first diameter. 실금을 제거에 사용되는 양방향 안정형 셀을 포함하는 밸브도 개시되어 있다. It discloses also a two-way valve comprising a stable cell for use in removing incontinence. 벌룬(balloon) 팽창 또는 자체 팽창 기능(self expanding function)을 가진 몇몇 종류의 스텐트(stents)가 판매되고 있다. Several types of stents (stents) having a balloon (balloon) or self-expanding expansion function (self expanding function) have been sold. 벌룬 팽창 스텐트는 일반적으로 두 방향으로 용이하게 소성변형될 수 있는(plastically deformed) 재료로 제조된다. Stent expansion balloon is generally made of a material (plastically deformed) which can be easily plastically deformed into two directions. 삽입 이전에, 상기 스텐트는 카테테르의 말단부(distal end)의 벌룬 섹션 둘레에 배치되어 함께 가압됨으로써, 외부 치수가 감소된다. Prior to insertion, the stent is being pressed together are placed on the balloon section, the circumference of the distal end of the catheter (distal end), the external dimensions are reduced. 상기 스텐트가 신체내의 적절한 축방향 위치에 도달하자 마자, 상기 벌룬에 공기를 주입하여 부풀림으로써 상기 스텐트는 팽창되어 소성변형될 수 있다. As soon as the stent is let reach the appropriate axial position in the body, the stent is expanded by inflation by injecting air into the balloon can be plastically deformed. 이 최종 위치에서, 상기 스텐트는 그 직경이 최대가 된 상태에 있게되며, 주변의 신체조직을 지지하기 위한 기능을 가져야 하고, 적어도 국부적으로 보다 작은 직경인 바람직하지 못한 형상으로 변화되는 것을 방지한다. In this final position, the stent is able to state the diameter of the maximum, thereby preventing to have the function to support the surrounding body tissues, and, at least to be changed locally in a more shape undesirable in small diameter. 따라서, 상기 스텐트는 반경방향으로 충분한 강성을 가질 필요가 있을 뿐만 아니라, 또한 그 최종 위치에 있을때에 축방향으로 소정의 가요성을 가질 필요가 있다. Thus, the stent is not only required to have a sufficient rigidity in the radial direction, and also needs to have a predetermined flexibility in an axial direction when in its final position. 또한, 상기 재료의 양은 가능한 작아야 하고, 스텐트의 내면에서는 채널을 통한 유동(예로서, 혈액 등)을 방해하지 않거나, 또는 너무 많은 난류(turbulence)를 유발하지 않아야 한다. In addition, the small amount of the material as possible, the inner surface of the stent should not flow through the channel does not interfere with (e. G., Blood, etc. ), or cause too much turbulence (turbulence). 이들 스텐트에 일반적으로 발생하는 문제점은 하기와 같다. Problems that generally occur with these stents are as follows. 상기 벌룬 둘레에서 상기 스텐트를 그 최소 직경으로 압축한 이후에는, 상기 스텐트는 약간 큰 직경으로 복귀하려는 몇몇의 탄성 스프링을 항상 가지고 있으며, 이는 상기 카테테르를 환자의 체내로 삽입할때 문제를 유발할 수 있다. Above, after compressing the stent to its smallest diameter in the balloon circumference, the stent is always have some elastic spring to return to a slightly larger diameter, which can cause problems when inserting the catheter into the body of a patient have. 부가적으로, 상기 벌룬과 스텐트 사이의 축방향 마찰은 스텐트가 카테테르 외부로 미끌어질 수 있을 정도로 작아질 수 있다. In addition, the axial friction between the balloon and the stent can be made small enough to be slipped into the stent catheter outside. 부가적으로, 스텐트의 크기가 크다는 것도 통상 단점이 된다. Additionally, also the size of the stent is greater the normal disadvantages. 또 다른 문제점은 이들 스텐트의 위축(recoil)이다. Another problem is the contraction (recoil) of these stents. 이는 벌룬 압력에 의해 팽창된 이후에, 벌룬에서 바람이 빠지자 마자 상기 스텐트의 외부 직경이 항상 조금 감소되는 것을 의미한다. This means that as soon as the wind on the balloon, after the expansion by the balloon pressure which he slipped the outer diameter of the stent is always slightly reduced. 이러한 위축의 정도는 10%에 달할 수 있어서, 스텐트의 이동(migration)을 유발할 수 있다. The extent of atrophy is able to reach 10%, may result in the movement (migration) of the stent. 다른 형태의 스텐트는 다소(more or less) 탄성적인 팽창 구조로 제조되며, 이는 소정의 외부 수단에 의해 카테테르상에 유지되어야만 한다. Other types of stents are made from a slightly (more or less) elastically expanding structure, which must be held on the catheter by some external means. 이런 형태의 예는 전달 외피(delivery sheath)에 의해 압축된 상태로 유지되는 스텐트이며, 상기 전달 외피는 상기 스텐트가 그 원래의 형태로 전개되어야만 할때 제거된다. Examples of this type is a stent that is held in a compressed state by a delivery sheath (delivery sheath), the delivery sheath is removed when the stent is to be deployed to its original form. 이들 스텐트 중 몇몇은 초탄성 거동(superelastic behavior) 팽창 기능 또는 온도 감지 트리거링(temperature sensitive triggering) 팽창 기능 중 하나를 가진 형상 기억 재료로 제조된다. Some of these stents are made of a superelastic behavior (superelastic behavior) or the function expansion temperature sensing activation (temperature sensitive triggering) expansion function shape memory with one of the materials. 이들 자체 팽창 스텐트의 단점은 전달 외피가 필요한 것이며, 삽입 직경이 커진다는 것이다. A disadvantage of these self-expanding stent is that it will require a delivery sheath, the greater the insertion diameter. 또한, 외피의 제거시에 기단부(proximal end)에서 작동되는 외피 배출 기구(retraction mechanism)가 필요하다. In addition, the outer shell is required to be operated at a base end (proximal end) upon removal of the envelope ejection mechanism (retraction mechanism). 양자 모두의 형태의 대부분의 스텐트는 팽창 동안 길이가 비교적 많이 변화된다는 것과, 금속 와이어 또는 스트러트(struts)의 형상으로 인하여 유체역학적 거동(hydrodynamic behavior)이 열악하다는 단점을 부가적으로 가지고 있다. Most stents of both types has a disadvantage that as a length of a relatively large change during expansion, due to the shape of the metal wires or struts (struts) poor hydrodynamic behavior (hydrodynamic behavior) additionally. 일부 스텐트의 다른 단점은 양의 탄성율(positive spring rate)며, 이는 벌룬 압력을 증가시켜야만 추가적인 팽창이 달성할 수 있다는 것을 의미한다. Another disadvantage of some stents is the elastic modulus of the said positive (positive spring rate), which means that to achieve the additional expansion of the balloon pressure be increased. 종래의 스텐트의 구조는 일반적으로 스텐트상에 반경방향으로 작용하는 외력을 이용하며, 이는 상기 구조의 와이어와 스트러트상에 굽힘력(bending force)을 유발한다. Structure of a conventional stent generally use an external force acting in the radial direction on the stent, which results in a bending force (bending force) on the wire and the struts of the structure. 예로서, 프로그래시브 앤지오플래스티 시스템즈 인코포레이티드(Progressive Angioplasty Systems, Inc.)에서 생산된 ACT 원 코러네리 스텐트(ACT One Coronary stent)나 존슨 앤드 존슨 인터벤쇼널 시스템즈(Johnson & Johnson Interventional Systems)에서 생산된 팔마쯔-샤쯔 스텐트(Palmaz-Schatz stent)의 유니트 셀은, 접혀진 상태에서 평탄한 직사각형 형상을 가지며, 팽창된 상태에서는 거의 직선 스트러트(플라쯔-샤쯔)나 보다 굴곡된 스트러트(ACT 원)를 가지는 개략적인 다이아몬드 형상을 갖는다. For example, the progressive and geo flash styryl Systems, Inc. (Progressive Angioplasty Systems, Inc.) The original ACT koreo Neri stent (ACT One Coronary stent) or Johnson & Johnson inter Ben syoneol Inc. (Johnson & Johnson Interventional produced in Systems) arm Matsumoto produced in-unit cell of the shirt stent (Palmaz-Schatz stent) is, it has a flat rectangular shape in the folded state, in the expanded state almost straight struts (Plastic Etsu - shirt), the strut flexure than me (ACT It has a rough diamond shape having a circle). 이런 스텐트의 유니트 셀의 형상은 일반적으로 각각 동일한 단면을 갖는 4개의 스트러트에 대해 대칭이다. This shape of the unit cell of the stent is generally symmetrical with respect to the four struts having the same cross-section, respectively. 부가적으로, 셀의 축방향 하중은 일반적으로 모든 스트러트의 탄성 또는 소성 변형을 유발하여 축방향으로 유니트 셀을 신장시킨다. Additionally, the axial load of the cell is typically induce elastic or plastic deformation of all of the struts thereby extending the unit cell in the axial direction. 이들 유니트 셀은 양의 탄성율을 갖는다. The unit cell has a modulus of elasticity of the two. 이들 유니트 셀에 기초한 스텐트에 있어서는, 반경방향 압력에 대한 안정성은 단지 스트러트 및 그 연결부의 굽힙 강도에 의존한다. In stents based upon these unit cells the stability against radial pressure is merely dependent on the bending strength of the struts and their connections. 본 발명에서, 음의 탄성율과 양방향 안정 기능(bistable function)을 가진 유니트 셀을 가진 새로운 형태의 스텐트를 개시하고 있다. In the present invention, it discloses a new type of stent that has a unit cell having a negative bi-directional stability and modulus functions (bistable function). 이런 유니트 셀은 다른 의료용 작업에도 사용될 수 있다. These unit cells can be used in other medical tasks. 이는 두가지 형상을 가지고 있는 것을 의미하며, 상기 형상에서는 외력을 작용하지 않고도 이를 그 형상으로 유지할 수 있다는 것을 의미한다. This means that with two shapes and, the shape in the sense that it, without the action of external force can be maintained in that shape. 상기 유니트 셀은 둘 이상의 상이한 섹션을 사용하여 형성되어 있다. The unit cell is formed using at least two different sections. 하나의 섹셕은 다른 섹션보다 덜 유연하며(less pliable), 더 유연한 섹션의 형상이 한방향으로 변화되는 것을 억제하는 상대적인 강성 지지부로서 작용한다. One seksyeok acts as a relatively rigid support portion for suppressing and less flexible than the other section (less pliable), The shape of the flexible section is to be changed in one direction. 다른 방향에서는, 상기 유연한 섹션은 변형될 수 있으나, 상기 강성부로부터의 대향력으로 인해서, 상기 유연 또는 가요성 섹션의 안정성은 현저히 증가된다. In the other direction, the flexible section may be varied. However, due to the large hyangryeok from the rigid portion, the resistance of the flexible or flexible section is significantly increased. 대부분의 유연한 섹션에 수직인 방향의 외력은 강성 섹션으로 분산되고, 상기 유연한 섹션의 단면은 단지 압축된 상태에서만 하중을 받는다. An external force in the direction perpendicular to the most flexible section is distributed into rigid section, the cross-section of the flexible section is subjected to load only in a compressed state. 이것은 종래의 스텐트보다 더 강한 구조가 되게 한다. This allows a stronger structure than the conventional stent. 종래의 스텐트에 있어서, 모든 스트러트는 일반적으로 동일한 단면 및 기계적 특성을 가지며, 단지 굽혀진 상태에서만 사용된다. In the conventional stent, all struts have generally the same cross section and mechanical properties to, and is used only in the bent state. 상기 유니트 셀에 기초한 스텐트의 구성은, 장치가 손가락의 압력에 의해 벌룬 둘레에서 탄성적으로 용이하게 압축될 수 있도록 해준다. 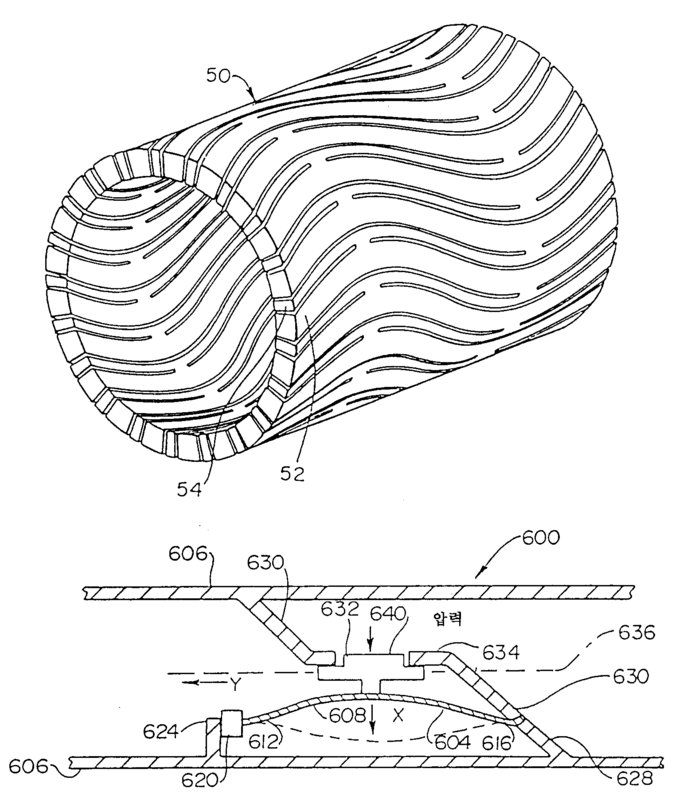 Configuration of the stent based on the unit cell, allowing the device to be compressed to facilitate elastically in the circumferential balloon by finger pressure. 소정의 임계 직경 미만에서, 본 발명의 스텐트는 안정된 가장 작은 직경으로 부가로 스냅(snap)되고, 따라서 상기 팽창된 발룬을 가능한 작은 삽입 직경을 가지고 상기 카테테르의 표면상에 견고하게 유지한다. In less than a given critical diameter, the stent of the present invention is stable smallest diameter portion snaps (snap) to a, and thus have a small insertion diameter as possible to the expanded balun is firmly held on the catheter surface. 부가적인 외피는 필요하지 않지만, 부가의 안전성을 제공하기 위해 사용될 수 있다. Additional sheath is not required, but may be used to provide additional safety. 상기 스텐트가 환자의 체내에 적절한 축방향 위치로 삽입된 이후에, 상기 벌룬은 상기 스텐트가 그 임계 탄성 평형 직경(critical elastic equilibrium diameter)에 도달할때 까지 팽창될 수 있다. After the stent is inserted into the appropriate axial position in the body of the patient, the balloon can be inflated until the stent reaches its critical elastic equilibrium diameter (critical elastic equilibrium diameter). 상기 임계 탄성 평형 직경보다 조금 더 큰 상태에서는, 상기 스텐트는 자동으로 그 최종의 최대 직경으로 추가적으로 팽창하게되며, 상기 최종 최대 직경에서는 반경 방향 압력에 대해 최대의 안정성을 갖게 된다. In a little larger than the diameter of the critical elastic equilibrium, the stent is further expanded automatically to the maximum diameter of the end, in the final maximum diameter will have a maximum stability against radial pressure. 상기 형태는 균일한 길이의 큰 팽창비를 가능하게 하며, 신뢰성있는 팽창성 및/또는 작은 표면비(surface ratio)를 가능하게 한다. It said shape enables the large expansion ratio enables the uniform length, reliable expandable and / or a small surface ratio (surface ratio) on. 본 발명의 부가적인 실시예는, 안정한 직경의 범위를 가지고 단계적으로 팽창하는 종류의 스텐트를 실현한 것이다. Additional embodiments of the present invention is realized a kind of stepwise expanding stent to have a range of stable diameters. 본 발명의 다른 일부는, 스텐트가 배치되게 되는 체내 캐비티(cavity)의 형상에 가능한 양호하게 적용하도록 그 길이 방향을 따라서 몇몇의 외경을 가지는 스텐트에 관한 것이다. Other portions of the present invention, along the longitudinal direction thereof so that the stent is favorably applicable to the shape of the body cavity (cavity) that is to be disposed directed to a stent having a diameter of several. 본 발명의 다른 일부는, 상기 유니트 셀의 힘 변위 특성(force displacement characteristic)이 비대칭적이 되거나 심지어 양방향 안정 기능 대신 단일 안정(monostable) 기능을 나타내도록 팽창된 직경 또는 접혀진 직경 중 어느 하나가 가장 안정한 상태가 되도록 열처리에 의해서 유니트 셀 내의 응력(stress) 및 변형(strain)패턴을 변형시킨 것이다. Other portions of the present invention, the force displacement characteristics (force displacement characteristic) is asymmetric, or even two-way stabilizing function, instead of a single stable (monostable) any one of the expanded diameter or the collapsed diameter to indicate the function of the most stable state of the unit cell which will transform the stress (stress) and deformation (strain) in the unit cell patterns by the heat treatment so. 본 발명의 다른 실시예는 유니트 셀의 변위 특성에 대해 대칭 또는 비대칭의 양방향 안정이나 단일 안정력을 달성하도록 몇몇 스트러트의 단면의 기하학적 형상을 변형한 것이다. Another embodiment of the present invention is a modification of the geometry of the cross section of some struts to achieve the symmetric or asymmetric bi-directional stability and not a single tuck in against displacement characteristics of a unit cell. 본 발명의 다른 일부는, 하나 이상의 유니트 셀을 체내 캐비티 개구를 확장하거나 신체의 일부 또는 몇몇 신체 조직을 클램핑 또는 유지하는 예로서, 확장 장치(expander) 또는 클립(clip)으로써 다른 의료용 작업에 사용하는 사용법에 관한 것이다. Another portion of the present invention includes, as an extension device (expander) or clips (clip) to be used for other medical work by way of example that one or more unit cells, expand the body cavity opening or clamping or holding some or some tissues of the body It relates to the usage. 또한, 본 발명은 두 혈관(vessel)을 함께 결합하도록 본 발명의 확장 링과 함께 본 발명의 스텐트를 사용하는 것에 관한 것이다. The present invention also relates to the use of a stent of the present invention with the expansion ring of the present invention to bond together the two blood vessel (vessel). 또한, 본 발명은 양방향으로 위치되는 스냅 작용 유니트 셀을 가진 양방향 안정형 밸브와, 특히, 실금(incontinence)을 방지하도록 상기 양방향 안정형 밸브를 사용하는 사용법에 관한 것이다. The present invention also relates to the use of using the two-way valve to prevent stable stable two-way valve and, in particular, incontinence (incontinence) with a snap action, the unit cell is positioned in both directions. 또한, 본 발명은 다중 안정형 셀과 이를 의료용 장치에 사용하는 것에 관한 것이다. The present invention also relates to the use of the multi-stable cell, and thereby the medical device. 본 발명 스텐트의 구성은 특정 방식으로 안정성을 확보하는 유니트 셀의 배열을 가진 일련의 소자를 포함한다. The configuration of the present invention the stent includes a series of device having an array of unit cells to ensure the stability in a particular way. 각각의 유니트 셀은 상이한 기계적 거동을 가지는 둘 이상의 별개의 기계적으로 연결된 섹션의 외부에 존재한다. Each unit cell is present on the outside of the section connected with two or more separate mechanical having a different mechanical behavior. 하나의 섹션은 보다 가요성을 가지는 반대방향으로 작용하는 섹션을 위한 상대적인 강성 지지부로서 작용한다. One section acts as a relatively rigid support for the section which acts in the opposite direction has a more flexible. 상기 보다 가요성의 섹션은 전부는 아니더라도 스텐트의 팽창의 대부분을 담당하게 된다. A flexible section than the above, if not all, will be responsible for most of the expansion of the stent. 본 발명의 원리에 기초하여 스텐트를 제조하는 방법에는 몇가지 방법이 있으며, 상기 스텐트는 폴리머(polymer), 복합물(composite), 종래의 재료 또는 초탄성 거동이나 온도 감지 거동을 가지는 형상 기억 합금과 같은 몇몇 재료로 제조될 수 있다. Method for producing a stent on the basis of the principles of the present invention has a number of ways, the stent is a polymer (polymer), a composite (composite), some, such as a shape memory alloy having a conventional material or a superelastic behavior or temperature sensitive behavior It may be made from a material. 이는 특정 위치에서 서로 용접된 와이어 또는 스트립의 배열로 형성될 수 있다. This may be formed by an array of welded wire or strip with each other at a particular location. 다른 방법으로서는, 기판상에 소정 패턴으로 금속을 증착하거나, 미리 합금으로 조성된 파우더(prealloyed powder)를 소결(sintering)하는 방법을 사용할 수 있다. As another method, depositing metal in a predetermined pattern on the substrate, or may be used a method of sintering (sintering) to the powder (prealloyed powder) an alloy composition in advance. 또다른 방법은 에칭, 그라인딩, 커팅(예로서, 레이저나 물 등을 이용하여), 스파크 침식(spark erosion) 또는 다른 적절한 방법으로 벽상에 슬릿이나 슬롯(slot)의 패턴이 형성되어 있는 관형 시작재료(tubular shaped starting material)로 스텐트를 제조하는 것이다. Another way is etching, grinding, cutting (e.g., laser or by using a water), spark erosion (spark erosion) or to the walls by any other suitable method a pattern of slits or slots (slot) is formed on a tubular starting with material to produce a stent with (tubular shaped starting material). 상기 패턴은 평탄한 플레이트(plate)상에 제조하고, 그후에, 용접, 납땜 또는 크림핑(crimping) 등으로 어느 정도 원통형 형상 또는 큰 직경을 가지는 2개의 원추형 단부를 가지는 원통형 중앙 섹션으로 형성하여 제조될 수도 있다. The pattern is a flat plate (plate) produced on, and subsequently, welding, soldering or crimping (crimping), such as more or less cylindrical shape or a two conical end for having may be prepared by forming a cylindrical center section having a larger diameter have. 도 1a 내지 도 1c는 양방향 안정형 기구의 원리를 도시하는 도면. Figure 1a to 1c are views showing the principle of a two-way mechanism stable. 도 2는 도 1의 기구의 힘-변위 특성을 도시하는 도면. 2 is the power of the instrument of Figure 1 illustrates the displacement characteristics. 도 3은 비대칭 양방향 안정성을 가진 다른 양방향 안정형 기구를 도시하는 도면. Figure 3 is a view showing another stable two-way mechanism with an asymmetric bi-directional stability. 도 4는 도 3의 기구의 힘-변위 특성을 도시하는 도면. Figure 4 is the power of the instrument of Figure 3 - a chart showing the displacement characteristics. 도 5a는 안정하게 완전히 접혀진 형상의 본 발명의 관형 스텐트를 도시하는 도면. Figure 5a is a diagram showing a tubular stent of the present invention of a stable fully collapsed configuration. 도 5b는 안정하게 완전히 팽창된 형상의 본 발명의 관형 스텐트를 도시하는 도면. Figure 5b shows a tubular stent of the present invention in the stable fully expanded configuration. 도 6은 안정하게 팽창된 형상으로 도시되어 있는 하나의 양방향 안정형 유니트 셀을 가진 스텐트의 일부를 도시하는 도면. 6 is a view showing a portion of a stent with a two-way stable unit cell is shown in a stable expanded configuration. 도 7은 도 6의 스텐트의 일부를 그 탄성 양방향 안정 평형 위치 근방에 있는 상태로 도시하는 도면. 7 is a diagram showing a portion of the stent of Fig. 6 to the state in the vicinity of the two-way acoustic stable equilibrium position. 도 8은 안정하게 접혀진 형상의 도 6 및 도 7의 스텐트의 일부를 도시하는 도면. Figure 8 is a view showing a portion of the stent of stably folded 6 and 7 of the contour. 도 9는 몇몇 유니트 셀은 접혀져 있는 형상으로 있고 몇몇 유니트 셀은 팽창되어 있는 형상으로 도 6 및 도 8의 스텐트의 보다 큰 섹션을 도시하는 도면. 9 is some unit cells in the form folded in and some unit cells is a view showing a larger section of the stent of FIGS. 6 and 8 in a shape that is expanded. 도 10은 가요성 연결부로 함께 결합된 복수개의 보다 작은 스텐트로 형성된 본 발명의 스텐트를 도시하는 도면. 10 is a view showing the stent of the present invention formed from a plurality of smaller stents joined together with flexible connection. 도 11은 하나 이상의 양방향 안정형 유니트 셀을 가지는 부분적으로 팽창되어 있는 본 발명의 스텐트를 도시하는 도면. 11 is a view showing the stent of the present invention is expanded to a part having at least one two-way stable unit cell. 도 12는 그 길이 방향을 따라 소정 범위의 직경을 가지는 본 발명의 스텐트를 도시하는 도면. 12 is a view showing the stent of the present invention has a diameter in a predetermined range along the direction of its length. 도 13은 팽창된 상태로 있는 본 발명의 팽창 링을 도시하는 도면. Figure 13 is a chart showing the expansion ring of the invention, which in the inflated state. 도 14는 수축된 상태로 있는 본 발명의 팽창 링을 도시하는 도면. Figure 14 is a chart showing the expansion ring of the invention, which in the contracted state. 도 15는 본 발명의 팽창 링과 부가적으로 결합되어 두개의 혈관을 혈관 외측에서 함께 결합하는 본 발명의 스텐트를 도시하는 도면. 15 is coupled to the ring expansion and addition of the present invention illustrates the stent of the present invention for joining together two vessels at the blood vessel outside. 도 16은 도 15의 16-16선을 따라 취한 횡단면을 도시하는 도면. 16 is a view showing a cross section taken along the line 16-16 of Figure 15. 도 17은 혈관 내측에서 두개의 혈관을 함께 결합하는 본 발명의 스텐트를 도시하는 도면. 17 is a view showing the stent of the present invention for joining together two vessels inside the blood vessel. 도 18은 본 발명의 팽창 링과 클램프로 함께 결합된 두개의 혈관을 도시하는 도면. 18 is a view showing a two vessel, combined with the expansion ring and the clamp of the invention. 도 19는 폐쇄 위치의 양방향 안정형 밸브를 도시하는 도면. 19 is a view showing a two-way valve in the stable closed position. 도 20은 개방 위치의 도 19의 양방향 안정형 밸브를 도시하는 도면. 20 is a view showing an open position of the two-way valve of the stable Fig. 도 21a는 완전히 수축된 상태의 다중 안정형 셀을 도시하는 도면. Figure 21a is a diagram that illustrates a multi-stable cell in a fully contracted state. 도 21b는 완전히 팽창된 상태의 도 21a의 다중 안정형 셀을 도시하는 도면. Figure 21b shows a multi-stable cell of Figure 21a in a fully expanded state. 도 22a는 완전히 수축된 상태의 다른 다중 안정형 셀을 도시하는 도면. Figure 22a is a view showing another multi-stable cell in a fully contracted state. 도 22b는 완전히 팽창된 상태의 도 22a의 다중 안정형 셀을 도시하는 도면. Figure 22b shows a multi-stable cell of Figure 22a in a fully expanded state. 도 23은 도 21a 및 도 21b에 도시된 몇몇 유니트 셀이 서로 결합되어 완전히 팽창되어 있는 상태를 도시하는 도면. Figure 23 is a view showing a state in which the fully expanded been bonded to each other to some unit cell shown in Fig. 21a and Fig. 21b. 도 24a는 도 22a 및 22b에 도시된 몇몇 유니트 셀이 서로 결합되어 완전히 수축되어 있는 상태를 도시하는 도면. Figure 24a is a view showing a state in which the shrinkage is completely coupled to each other several unit cells illustrated in Figure 22a and 22b. 도 24b는 도 24a의 상호연결된 셀들을 완전히 팽창된 상태로 도시하는 도면. Figure 24b is a view illustrating a fully expanded state of the interconnected cell of Figure 24a. 도 24c는 도 24a의 상호연결된 셀들을 팽창하는 도중의 상태로 도시하는 도면. Figure 24c is a view showing a state on the way of expansion of the interconnected cell of Figure 24a. 도 24d는 도 24a 및 24b의 함께 결합되어 있는 셀들이 상호연결된 셀의 스트립 몇개를 팽창하는 도중의 상태로 도시하는 도면. Figure 24d is a view showing a state on the way to the expanded strip are several interconnected cells cells that are bound together in Fig. 24a and 24b. 도 1은 스텐트의 기본 원리를 설명하는 도면으로서, 도 1a는 길이가 L인 로드(1)를 도시하고 있으며, 이는 축방향 유닛으로 압축되어 좌굴 응력에 도달하게 된다. 1 is a view for explaining the basic principle of the stent, and to Figure 1a shows a rod 1 with a length of L, which is compressed in the axial direction of the unit is reached buckling stress. 그후에, 로드의 중앙부는 측방향으로 굴곡된 위치(2 또는 3; 도 1b에서 점선으로 도시되어 있음)로 굴곡되게 된다. Thereafter, the central portion of the rod is bent in a direction where the side; is to be bent (2 or 3 that is shown in phantom in Fig. 1b). 상기 로드 단부의 축방향 변위(ΔL)가 외부 클램프(4)에 의해 안정하게 유지되게 될 때, 로드의 중앙 섹션은 두개의 안정 위치(2, 3) 사이에서 이동시킬 수 있다. When the axial displacement (ΔL) of the rod ends to be maintained stably by the outer clamps (4), the center section of the rod can be moved between two stable positions 2 and 3. 이러한 이동은 로드의 원래 길이 축(AA)에 수직인 방향(X)이다. This movement is in a direction (X) perpendicular to the original length axis (AA) of the rod. 안정 위치(2, 3) 사이의 모든 위치는 불안정하다. All positions between stable positions 2 and 3 are unstable. 도 1b에서, 상기 로드의 중앙 섹션은 로드가 X 방향으로 이동될 수 있기 이전에 각도(β)에 걸쳐서 회전되어야만 한다. In Figure 1b, the center section of the rod has to be rotated over the angle (β) to the load before it can be moved in the X direction. 도 1c는 로드(1)의 두번째 굴곡 상태를 도시하고 있으며, 이는 로드(1)의 중앙부를 클램핑하여 이 부분을 축(AA)과 평행하게 유지시킴으로써 각도(β)에 걸친 회전이 대향되어 있는 상태에서 발생된다. State in FIG. 1c is a second bending state, and city, which is rotated over the angle (β) by parallel keeping this portion to clamp the central portion of the rod (1) and the axis (AA) of the rod (1) counter It is generated from. 도 2는 수평 방향으로 도시되어 있는 변위(X)의 함수로써 힘(F)을 도시하고 있다. Figure 2 illustrates the force (F) as a function of displacement (X) which is shown in the horizontal direction. 상기 로드는 도 1의 상부 안정 위치(2)로부터 하부 안정 위치(3)로 이동된다. The rod is moved to the lower stable position 3 from upper stable position 2 of Fig. 힘은 0으로부터 F MAX 까지 신속하게 증가한다. Force is rapidly increased up from 0 F MAX. 그때, 도 1b 및 도 1c에 도시되어 있는 제 1 또는 제 2 굴곡 상태중 어느 하나에 도달하게 된다. Then, it is reached to any one of the first or the second bending state, which is shown in Figure 1b and Figure 1c. 이 스프링 시스템이 음의 탄성율을 가지기 때문에 X방향의 추가적인 변위를 위해서는 보다 작은 힘이 소요된다. Because the spring system will have a modulus of elasticity of the sound to a further displacement in the X direction takes a smaller force. 힘이 중앙 위치에서 0에 도달하고, 추가적인 이동은 자동으로 발생하게 된다. Force reaches zero in the central position, and further movement is automatically generated. 상기 시스템이 완전히 대칭으로 되며, 하부 안정위치로부터 상부 안정 위치로 복귀하는데 소요되는 힘은 동일한 특성을 갖는다는 것을 도 2로부터 알 수 있다. And wherein the system in a completely symmetrical, from the lower stable position the force required to return to the upper stable position can be seen from Fig. 2 that have the same characteristics. 도 3에는 하중이 부여되지 않은 위치에서도 길이가 L-ΔL인 사전 설정된 굴곡을 갖고 있기 때문에, 비대칭적인 힘-변위 특성을 갖는 로드(5)를 도시하고 있다. It shows a rod 5 with a displacement characteristics - 3, the asymmetrical force, because of having a predetermined bending load is given in the non-position of length L-ΔL. 이는 종래의 소성 변형, 열처리 또는 로드의 단면(도시되지 않음)의 비대칭적인 기하학적 형상의 사용에 의해 달성될 수 있다. This may be accomplished by the use of an asymmetrical geometry of the conventional plastic deformation, the cross section of the heat treatment or the rod (not shown). 도 3의 로드(5)는 길이가 L-ΔL인 2개의 클램프 사이에 장착될 수 있고, 도 1b 및 도 1c의 로드와 동일한 방식으로 탄성적으로 변형되는 경우에, 최종 위치(2, 3)의 단면에서 도 1의 로드와 비교하여 상이한 응력 분포를 갖게된다. Rod 5 of Figure 3 when the length may be mounted between the two clamp L-ΔL, is elastically deformed in the same way as the rod of Fig. 1b and Fig. 1c, the final position (2, 3) by comparison of Figure 1 and the load of the cross section it will have a different stress distribution. 이는 상기 로드가 도 3에 도시된 바와 같이 하중이 가해지지 않은 상태의 안정 위치가 됨을 의미한다. This means that the rest position of the state that is not the load is applied as illustrated in which the rod 3. 도 4는 도 3의 미리 굴곡된 로드의 비대칭 힘-변위 특성을 도시한다. It shows the displacement characteristics - Figure 4 is an asymmetric force of the pre-bent rod of FIG. 상부 안정 위치로부터의 초기 변위는 시동력(F1)을 필요로 하며, 로드가 그 하부 안정 위치에 있는 경우에는 F1보다 작은 단지 F2의 대향방향 시동력이 소요된다. The initial displacement from the stable upper position needs a starting force and is (F1), if the load in the lower stable position, it takes the opposite direction starting force of less than F1 F2 only. 힘(F2)은 원하는 만큼 작게될 수 있으며, 심지어 0이나 음의값으로도 될 수 있지만, 하부 위치의 안정성이 필요한 경우에는 양의 값(positive value)을 가질 필요가 있다. The force (F2) is in some cases may be as small as desired, but even may be also a value of zero or negative, the stability of the lower position is required, needs to have a positive value (positive value). 도 5a 및 5b는 각각 완전히 수축되어 있는 상태와, 완전히 팽창되어 있는 상태로 본 발명의 관형 스텐트의 일반적인 외관을 도시하고 있다. Figure 5a and 5b shows the general appearance of a tubular stent of the present invention in a state that is fully expanded and the fully contracted state, respectively. 도면부호 50으로 도시되어 있는 완전히 수축된 상태와, 도면부호 60으로 도시되어 있는 완전히 팽창된 상태에서, 상기 스텐트는 복수개의 상호연결된 양방향 안정형 유니트 셀(도 5b의 팽창된 상태에서 도면 부호 64로 도시되어 있음)로 구성된다. Reference numerals in the fully expanded position, which is shown in a fully contracted state, and the reference numeral 60, which is shown as 50, the stent comprises a plurality of mutually associated interactive stable unit cells (shown in the expanded state in Fig. 5b by the reference numeral 64 is consists of that). 상기 양방향 안정형 유니트 셀은 단부(70, 72)에서 함께 결합되어 있는 제 1의 상대적 강성 세그멘트(segment)(52; 도 5b의 66) 및 제 2 상대적 가요성 세그멘트(54; 도 5b의 68)로 형성되어 있다. A, (68 in Fig. 5b 54); the two-way stable unit cell end portions 70 and 72 are coupled together at a first relatively rigid segment (segment) of which (52 66 in Fig. 5b) and a second relatively flexible segment It is formed. 제 2 상대적 가요성 세그멘트(68)는 인접한 상대적 강성 부재(66)에 상호연결되어 있다. A second relatively flexible segment 68 can be interconnected to the adjacent relatively rigid members (66). 종방향으로 인접한 셀(종축은 도면 부호 75로 도시되어 있음)은 단부(70, 72)에서 결합된다. Cells adjacent in the longitudinal direction (in the vertical axis is shown by reference numeral 75) are joined at the ends 70,72. 균일한 반경방향 외향 또는 내향력을 적용함에 의해, 상기 스텐트는 완전히 수축된 상태로부터 완전히 팽창된 형상으로 또는 그 반대로 직접적으로 전환될 수 있다. By applying a uniform radially outward or in hyangryeok, the stent may be switched directly to or to the opposite fully expanded shape from a fully contracted state. 도 6(도 5b의 인세트(inset) 6에 대응하는)은 본 발명에 따른 유니트 셀의 양방향 안정 기능을 이용하는 도 5에 도시된 바와 같은 스텐트의 작은 일부를 도시한다. Figure 6 (corresponding to Fig. 5b inset (inset) of 6) shows a small portion of the stent as shown in Figure 5 using the two-way stabilizing function of the unit cell of the present invention. 도면에는 스텐트의 중앙축과 평행한 수평선(AA)이 도시되어 있다. Figure has parallel horizontal lines and a central axis of the stent (AA) is shown. 이들은 개별적인 크기의 두 열의 사인곡선이다(개관이 도시된 도 9 참조). These are sinusoidal in two columns of the respective sizes (refer to Fig. 9 the overview shown). 상기 세그멘트(7, 9)는 상대적으로 큰 단면을 가진다. The segment (7, 9) has a relatively large cross-section. 단지, 세그멘트(9)만이 완전히 도시되어 있다. Only, segment 9 is shown entirely. 세그멘트(8, 10)는 상대적으로 작은 단면을 가지며, 본 도면상에는 단지, 세그멘트(8)만이 완전히 도시되어 있다. Only the segments (8, 10) has a relatively small cross-section, just formed on the drawing, the segment 8 is entirely shown. 상기 세그멘트들은 결합부(11, 12)에서 예로서 용접으로 상호연결되어 있다. The segments are interconnected by welding by way of example in the coupling part (11, 12). 세그멘트(8, 9)의 단면 사이의 차이로 인하여, 세그멘트(8)를 변형시키는데 필요한 힘은 세그멘트(9)를 변형시키는데 필요한 힘보다 작다. Due to the difference between the cross section of segment 8 and 9, the force required to deform the segment (8) is less than the force required to deform the segment (9). 따라서, 세그멘트(9)는 축(AA)에 평행하게 축방향으로 상기 결합부(12) 사이의 상대적인 변위에 대항하는 도 1b에서의 클램프(4)와 유사한 상대적인 강성 클램프로서 생각할 수 있다. Therefore, segment 9 can be considered as a relative rigid clamp similar to the clamp (4) in Figure 1b against the relative displacement between the engaging portion (12) parallel to the axis (AA) in the axial direction. 이와는 대조적으로, 세그멘트(8)는 도 1에 도시된 로드(1) 또는 도 3에 도시된 로드(5)와 같은 가요성 로드로서 작용하게 된다. In contrast, segment 8 is to act as a flexible rod such as the rod 5 illustrated in the rod 1 or 3 shown in Fig. 상기 세그멘트의 조합(7,8 또는 9,10)은 세그멘트의 기하학적 형상과 하중이 부여되지 않은 상태에 따라 도 2 및 도 4에 도시된 곡선과 같은 힘-변위 곡선(FX)을 가지는 양방향 안정형 스프링 시스템으로서 작용하는 유니트 셀을 형성한다. The combination of the segment (7, 8, or 9, 10) is a force, such as the curves shown in Figs. 2 and 4 in accordance with the state where the geometry and weight of the segment is not granted-interactive with the displacement curve (FX) with stable spring to form a unit cell, acting as a system. 또한, 상이한 직경의 스트러트 또는 세그멘트를 사용하는 대신에 상기 세그멘트는 상이한 강도 또는 강성을 나타내는 동일한 직경(즉, 단면적)의 것을 사용하여도 동일한 효과를 달성할 수 있다. In addition, the segment instead of using segments or struts of different diameter is also able to achieve the same effect with that of the same diameter (i.e., sectional area) showing a different strength or stiffness. 이런 강도 또는 강성의 차이를 얻는 한가지 방법은, 상기 세그멘트에 상이한 재료를 사용하는 것이다. One method of obtaining the difference between such a strength or stiffness is to use a different material in the segment. 모든 세그멘트에 동일한 재료, 예를 들면 금속을 사용하면서 강성이 필요한 세그멘트에는 선택적으로 강화(예를 들어, 열처리 등에 의해)시켜주는 방법도 있다. The same material for all segments, for enhanced selective segment is necessary rigidity while example using a metal there is also a method by which (e. G., By heat treatment). 열처리가 모든 재료를 강화시켜주는 것은 아니라는 것을 인지하여야 한다. The heat treatment should be aware that not all the ingredients that enhance. 예로서, 니티놀(nitinol)은 열처리를 받으면 보다 유연해진다. For example, Nitinol (nitinol) will become more flexible and receives heat treatment. 그러나, 니티놀의 이런 특성은 니티놀의 하나의 섹션을 열처리되지 않은 니티놀의 두번째 섹션에 대해 보다 유연하게 만들도록 사용될 수 있다. However, these properties of the Nitinol may be used to create more flexibility for the second section of the non-heat-treated for one section of Nitinol Nitinol. 도 7은 탄성 평형 위치 근방에서 스텐트의 동일한 부분(도 6에 도시된 바와 동일한)을 도시하고 있다. 7 shows the same parts (the same shown in FIG. 6) of the stent near the elastic equilibrium position. 세그멘트(8)는 힘(F)에 의해 X 방향으로 변형되지만 세그멘트(9)는 그 강성이 더 크기 때문에 거의 원래의 형상을 갖고 있다. Segment 8 is deformed in the X direction by the force (F), but can have substantially the original shape because of the segment (9) is that the stiffness is greater. 도 8은 탄성 평형 위치로 가압된 이후의 도 6 내지 도 7의 스텐트의 동일한 유니트 셀을 도시한다. Figure 8 shows the same unit cell of the subsequent Figures 6 to 7 of the stent pressing an elastic equilibrium position. 이는 자동적으로 도 8의 안정 위치로 스냅된다. Which is automatically snap to the rest position of Fig. 이 스냅핑력은 상기 세그멘트를 제조하는데 사용되는 재료의 기계적 특성(예를 들어, 강도)에 따라 카테테르 축(도시되지 않음)상에 바람이 빠져있는 벌룬을 타이트하게 유지할 수 있을 정도로 강하다. The snap pingryeok is strong enough to maintain a tight balloon catheter shaft in a (not shown) out of the wind according to the mechanical properties of the material used to make the segment (e.g., strength). 이들 도면에 도시된 기하학적 형상에 있어서, 상기 스텐트가 그 최소의 안정된 직경에 있을때, 상기 세그멘트(8, 9)는 서로 밀접하게 합치되어 최소의 공간을 차지하게 된다. In the geometry shown in these figures, when the stent is in a stable size of the minimum, the segment (8,9) is closely conform to each other occupies a minimum of space. 도 9는 도 5의 스텐트를 평면화하여 예시하고 있으며, 하나의 세그멘트 소자(16)는 팽창하여 안정된 형상으로 도시하고 있고, 몇개의 가요성 세그멘트는 접혀져서 안정된 형상(세그멘트 14, 18 및 20)으로 도시하고 있다. 9 is a has been illustrated with flattened stent of Figure 5, one segment element 16 expands and shows a stable shape, one of the flexible segments is folded stable shape (segments 14, 18 and 20) shows. 상기 세그멘트(13, 15, 17 및 19)는 상대적인 강성 세그멘트이고, 실질적으로 그 본래의 형상으로 유지된다. The segment (13, 15, 17 and 19) is a relatively rigid segment, is substantially maintained in the original shape. 두개의 상대적인 강성 세그멘트 사이의 거리는 접혀져서 안정된 형상에서는 h로 도시되어 있고, 확장되어서 안정된 형상에서는 H로 도시되어 있다. The distance between the two folded stable shape relative rigid segments is shown as h, the expansion be stable shape is shown by H. X 방향의 변위값(Hh)은 연결 결합부의 크기와 세그멘트의 확장 또는 팽창된 유니트 셀의 높이에 의존한다. Of X-direction displacements (Hh) is dependent on the height of the expanded or the expanded unit cell of the connection joint of the segment size. 스텐트의 상술한 부분은 평면으로서 도시되어 있지만, 세그멘트(13)와 세그멘트(20)를 결합부(21)로 서로에 직접적으로 연결된다면 도 5에 도시된 바와 같은 원통형 스텐트를 형성할 수 있음이 명백하다. The aforementioned portions of the stent may be seen as a plane, the segments 13 and the apparent that to form a cylindrical stent as shown in Figure 5, if directly connected to each other at a connecting part 21 a segment 20 Do. 달리말해, 상기 스텐트는 결합부(21)를 따라 분리되어 평면화된 상태로 도시되어 있다. In other words, the stent is shown in a flattened condition are separated along the connecting part 21. 스텐트의 안정한 직경 범위는 가요성 세그멘트가 접혀진 안정 위치로부터 확장된 안정 위치로 스냅될 때 마다 (Hh)/π의 값으로 변화된다. Stable diameters of the stent range is changed to (Hh) / value of π every time the flexible segment snaps into the stable position extended from the retracted rest position. 결과적으로, 모든 직경에서 종래의 스텐트 보다 양호하게 외력을 견딜 수 있는 극도의 강성표면을 가진 스텐트가 제공된다. As a result, the stent is provided with a rigid surface capable of withstanding the extremely satisfactorily external force than the conventional stent in any diameter. 길이 방향에 있어서, 예로서, 몇몇 결합편(joint piece)을 결합부로서 유지하면서 하나 이상의 결합부의 중앙을 절단하는 등의 방식으로 몇몇의 유니트 셀을 그 이웃하는 유니트 셀로부터 분리시킴으로써 스텐트의 가요성이 증가될 수 있다. In the longitudinal direction, by way of example, several coupling pieces (joint piece) the flexibility of the stent, by the maintenance as a binding unit while separating some of the unit cells from their neighbor unit cells in a manner such as to cut at least one joint of the central castle this can be increased. 가요성을 증가시키는 다른 방법은, 길이 방향으로 유니트 셀의 몇몇 섹션의 기하학적 형상을 상대적인 가요성 형상으로 부터 상대적인 강성 형상으로 스텐트 전체 길이를 따라 수차례 반복되도록 변화시키는 것이다. Another method to increase flexibility is to ensure that changes in the longitudinal direction are repeated several times to the geometry of several sections of the unit cells along the entire length of the stent relative to the rigid shape from a relatively flexible shape. 달리말해, 도 9를 참조하면, 하나 이상 또는 각각의 세그멘트(13 내지 20)는 각 결합부(21) 이후에 교대로 직경이 큰 부분과 작은 섹션(또는 달리 표현하자면 가요성 및 강성 부분)이 존재하도록 구성될수 있다. In other words, FIG. 9, one or more or each of the segments (13 to 20) is alternately a large portion and a small section diameter after each coupling portion (21, gritty, or other words, the flexible and rigid part) is It can be configured to exist. 다른 방법은 도 10에 도시된 바와 같이, 단부 대 단부로 길이방향으로 정렬되고 각각의 유니트 셀을 형성하는 결합부로서 동일하거나 서로 다른 기하학적 형상 또는 구조를 가지는 가요성 결합부(104)로 연결되는 일련의 짧은 다중 안정형 스텐트(100)를 사용하는 것이다. The other way is through to a flexible coupling 104, the same or have a different geometric shape or structure are aligned in the longitudinal direction to the end for end as a coupling portion for forming each unit cell as shown in FIG. 10 It is to use a series of short multi-stable stent 100. 본 발명의 범위는 모든 형태의 재료를 포함하여만 한다. The scope of the invention should include all types of material. 가장 양호한 재료중 하나는 초탄성 니티놀이며, 그 이유는 탄성 변형이 크고, 플레토우 응력(plateau stress)으로 인해 응력값을 양호하게 한정할 수 있으며, 열처리에 의해 금속에 바람직한 굴곡을 형성할 수 있기 때문이다. One of the most preferred materials are second, and the elastic nitinol, so because the elastic deformation is large, play tow stress can be due to (plateau stress) preferably defines a stress value, to form a desired bend in the metal by the heat treatment Because. 니티놀의 스텐트는 접혀진 안정 상태 또는 소형의 안정 상태의 직경인 튜브내에 슬릿 또는 슬롯을 형성함으로써 제조될 수 있다. The stent of Nitinol can be made by forming slits or slots in the tube diameter of the folded steady state or of a small steady state. 그다음, 슬롯이 형성된 튜브는, 분리된 성형 공구(seperate shaping tool)에 의해 확장되게 되며, 변형되지 않은 형상으로서 팽창된 안정 직경을 형성하도록 상기 공구상에서 열처리된다. Then, the tube a slot is formed, is heat-treated on the tool to form a is to be expanded by a separate shaping tool (seperate shaping tool), swelling as a non-deformed shape stable diameter. 보다 일반적으로, 본 발명은 복수개의 안정 형상을 가지는 장치에 관한 것이다. More generally, the invention relates to a device having a plurality of stable shape. 상기 장치는 복수개의 상호연결된 다중 안정형 셀을 포함한다. The apparatus includes a plurality of interconnected multi-stable cell. 상기 셀은 하나 이상의 상대적 강성 섹션과 하나 이상의 상대적 가요성 섹션을 포함하며, 상기 상대적 강성 섹션과 상대적 가요성 섹션은 복수개의 안정 형상을 가지는 다중 안정형 스프링 시스템의 형태로 셀 구조를 형성하도록 상호 연결된다. The cell includes one or more relatively rigid sections and one or more relatively flexible sections, said relatively rigid section and relatively flexible sections are interconnected to form the cell structure in the form of a multi-stable spring system having a plurality of stable shape . 양호한 실시예에 있어서, 상기 셀은 제 1 단부 및 제 2 단부를 가지는 제 1 아치형 부재와, 제 1 단부 및 제 2 단부를 가지는 제 2 아치형 부재를 포함하며, 상기 제 1 부재의 제 1 단부는 상기 제 2 부재의 제 1 단부와 소통되고, 상기 제 1 부재의 제 2 단부는 상기 제 2 부재의 제 2 단부와 소통되어 있다. In a preferred embodiment, the cell comprises a second arcuate member having a first and arcuate member, a first end and a second end having a first end and a second end, the first end of the first member communicates with the first end of the second member, the second end of the first member is in communication with the second end of the second member. 그러나, 상기 부재들은 정확히 아치형일 필요는 없음을 인지하여야 한다. However, the member should be aware of the need not exactly an arch. 비교적 직선형인 부재를 포함하는 다른 형상의 부재도 고려해볼 수 있다. Another member of the shape which includes a relatively straight member in Fig may be considered. 특히, 본 발명은 셀들이 두개의 안정 형상을 가지는 양방향 안정형 셀에 관한 것이다. In particular, the invention relates to a bi-directional cells with stable cells having two stable shapes. 이런 셀에 있어서, 제 1 및 제 2 섹션상의 대응 지점 사이의 거리는 셀의 제 2 안정 상태 보다 셀의 제 1 안정 상태에서 더 크다. In such a cell, the larger in the first stable state of the cell than the second stable state of the distance between the first cell and a corresponding point on the second section. 상기 셀 자체는 상기 장치 그 자체가 적어도 양방향 안정성을 갖도록 배열되고, 가능한 다중 안정성을 갖도록 배열된다. The cell itself is the device itself is arranged to have at least a bi-directional stability, are arranged so as to have a multi-stable as possible. 이런 장치에 있어서, 초기의 직경 크기와 최종적인 더 큰 직경 크기를 가지는 둘 이상의 형상을 갖는 원통형 스텐트가 상술되었다. In such a device, a cylindrical stent having two or more shape having an initial diameter size and a final larger diameter size has been described above. 그러나, 다중 안정형 스텐트도 생각해볼 수 있다. However, it is possible to think multi-stable stent. 따라서, 예로서 스텐트는 셀이 단계적인 방식(step-wise fashion)으로 소정 범위의 직경을 제공하도록 배열 및 설계될 수 있도록 구성될 수 있다. Thus, for a stent may be configured so as to be arranged and designed to provide the diameter of the predetermined range in the cell is a stepwise manner (step-wise fashion). 이런 방식 중 하나는 스텐트내에 몇몇의 상이한 형태의 셀을 사용하고, 각 셀의 형태는 사용되는 힘의 양에 따라서 스텐트가 상이한 직경을 갖게 되도록 상이한 스프링계수를 가진다. One such method is using several different types of cells in the stent, and has a different spring coefficient so that the stent has a different diameter depending on the amount of force the shape of each cell is used. 이러한 스텐트가 부분적으로 팽창되어 있는 상태로 도 11에 도시되어 있다. In a state that such a stent is partially expanded it is shown in FIG. 부분적으로 팽창된 스텐트는 도면 부호 120으로 도시되어 있다. The partially expanded stent is shown generally by reference 120. 상기 스텐트는 실질적으로 그 고유한 형상으로 유지되는 상대적인 강성 세그멘트(123, 127, 131, 135)와, 상대적인 가요성 세그멘트(125, 129, 133)를 포함한다. And the stent is substantially contains that of holding the unique shape relative rigid segments (123, 127, 131, 135) and, relative to the flexible segments (125, 129, 133). 상기 세그멘트는 결합부(122)로 상호연결된다. The segments are interconnected by coupling section 122. 제 1 가요성 소자(125, 133)는 팽창된 형상으로 도시되어 있고, 제 2 가요성 소자(129)는 수축된 형상으로 도시되어 있다. The first flexible element (125, 133) is shown in the expanded shape, and the second flexible element 129 is shown in a contracted shape. 반경방향 외향력이나, 접선 방향 힘을 적용함에 의해서, 상기 가요성 소자(129)는 그 최대 팽창 형상으로 튕겨져 스텐트(도시되지 않음)의 직경을 커지게할 수 있다. By the application of a radially outer hyangryeok or tangential force, the flexible element 129 may be thrown greater the diameter of the stent (not shown) in its maximum expanded configuration. 도 11에 도시된 바와 같이, 셀(138)은 수축된 상태에서 조차도 셀(136)보다 크다. As seen, cell 138 shown in Figure 11, even in the contracted state is greater than the cell 136. 제 1 가요성 소자(125, 133)는 제 2 가요성 소자(129)와는 가요성이 상이하다는 것을 특징으로 한다. The first flexible element (125, 133) is characterized in that the second flexible element 129 is different than flexible. 도 12에 도면부호 150으로 개략적으로 도시된 바와 같은 다른 형태의 스텐트는 제 1 단부(152)에서 제 1 직경을 가지고, 제 2 단부(154)에서 제 2 직경을 가지며, 제 1 단부(152) 및 제 2 단부(154) 사이의 영역(156)에서는 하나(또는 그 이상)의 중간 직경을 갖는다. Figure by reference number 150 in the 12 other types of stents, such as is schematically shown as has a first diameter at the first end 152, a second having a second diameter at an end 154, a first end (152) in the region 156, and between the second end (154) has a median diameter of one (or more). 상기 중간 직경은 제 1 및 제 2 직경과는 상이하다. The intermediate diameter is different from the first and second diameters. 도 12에 도면부호 150으로 도시된 바와 같이, 이런 스텐트에서 상호 연결된 셀은 모두 동일한 힘 상수를 가지고, 필요한 힘이 작용되었을때 동시에 개방될 수도 있고, 각각 그 자체의 힘 상수를 가지는 몇개의 상이한 형태의 셀이 사용될 수도 있다. As also by reference number 150 in 12 illustrated, both the interconnected cells in such a stent to have the same force constant, may be open at the same time as the force required is acting, several different types each having a force constant in itself this cell may be used. 직경의 다양화를 달성하기 위해서, 상이한 크기의 셀들이 사용될 수 있다. In order to achieve the diversification of the diameter may be used, cells of different sizes. 이런 형태의 스텐트의 일 실시예에 있어서, 상기 제 1 및 제 2 직경은 동일하고, 다른 실시예에서는 제 1 및 제 2 직경이 상이하다. In one embodiment of this type of stent, the first and second diameters are the same, and in other embodiments differs from the first and second diameters. 또한, 본 발명은 복수개의 안정 형상을 가지는 팽창형 스텐트를 주입하는 방법에 관한 것이다. The present invention also relates to a method of injecting the expansible stent having a plurality of stable shape. 이 방법은 카테테르상의 팽창 수단에 스텐트를 적용하는 단계와, 상기 스텐트를 소정의 신체 위치로 전달하는 단계와, 상기 스텐트를 제 1 안정 형상으로부터 제 1 안정 형상보다 더 큰 직경을 가지는 소정의 제 2 안정 형상으로 팽창시키도록 팽창수단을 팽창시키는 단계와, 팽창된 스텐트를 소정 신체 위치에 배치하는 단계를 포함한다. This is a predetermined first having a larger diameter than the first stable shape to the step of applying the stent to the inflatable means on the catheter, the method comprising: delivering the stent to a desired bodily location, the stent from a first stable shape step of expanding the expansion means to expand in two stable shape and, given the expanded stent comprises the step of placing the body in position. 상기 팽창 수단은 벌룬, 카테테르 내부 또는 카테테르상의 기계적 장치, 열에 의해 셀이 상태가 변화될 수 있을 때에는 열원, 또는 다른 소정의 적절한 팽창 수단일 수 있다. The expansion means may be a case a heat source, or other any suitable expansion means may be a cell that changes the state by the mechanical device, on the hotel balloon, a catheter or catheter inside the column. 상기 스텐트는 제 1 안정 형상내의 벌룬에 적용되거나, 적용 단계 동안에 상기 제 2 안정(팽창된) 형상에 적용될 수 있다. The stent may be applied to the first (expanded), or to the balloon in a stable shape, the second shape stability during the application stage. 후자의 경우에 있어서, 반경방향 내향 압력이 스텐트에 적용되어 스텐트를 제 1 안정 형상으로 가압하여 카테테르상에 스냅 결합되게 한다. In the latter case, the radially inward pressure is applied to the stent to be snap coupled by pressure to the stent in a first stable shape to the catheter. 상기 스텐트가 부가적인 안정 상태를 가지는 경우에, 스텐트는 스텐트의 직경이 제 1 상태의 직경과 제 2 상태의 직경 사이의 중간인 중간 안정 상태의 벌룬에 적용될 수 있다. If the stent is having an additional stable states, the stent may be applied to the intermediate stable states intermediate between the diameter of the stent first state in diameter to the diameter of the second state of the balloon. 또한, 상기 스텐트는 반경방향 내향 압력을 부가로 적용함으로써 팽창 수단상에 로킹될 수 있다. Further, the stent may be locked to the number of phase expansion by applying in addition to radial inward pressure. 본 발명의 부가적인 목적은, 팽창 장치(팽창 링)로서 단일의 양방향 안정형 유니트 셀을 사용하는 것이며, 상기 양방향 안정형 유니트 셀은 협소한 장소에 위치되어 그후에 팽창된 안정 형상으로 스냅식으로 복귀될 수 있다. A further object of the present invention, the expansion device is to use a single two-way stable unit cell of an (expansion rings), the bi-directional stable unit cells can be returned to snap into a is located at a narrow place thereafter expanded stable shape have. 도 13에 도시된 바와 같이, 도면부호 250으로 도시된 팽창 상태의 팽창 링은 제 1 단부(258) 및 제 2 단부(262)를 가지는 제 1 강성 부재(254)와, 제 1 단부(270) 및 제 2 단부(274)를 가지는 제 2의 보다 가요성의 부재(266)를 포함한다. And 13, the drawing expansion ring of the expanded state as shown by reference numeral 250 is a first end 258 and second rigid member 254 having an end 262, a first end (270) and a second end portion than the second flexible member 266 that has an 274. 제 1 부재(254)의 제 1 단부(258)는 제 2 부재(266)의 제 1 단부(270)에 연결되고, 제 1 부재(254)의 제 2 단부(262)는 제 2 부재(266)의 제 2 단부(274)에 연결된다. The first end 258 of the second being connected to a first end portion 270 of the member 266, the second end 262 of the second member (266 of the first member 254 of the first member 254 ) it is coupled to the second end 274. 도 14는 도 13의 팽창 링을 수축된 상태로 도시하고 있다. Figure 14 shows the expansion of the ring 13 into the contracted state. 제 2 안정 위치에서 제 2 부재(266)가 도시되어 있다. First and a second member 266 is shown in the second stable position. 본 발명의 다른 목적은, 클립으로서 단일의 양방향 안정형 루프(유니트 셀)을 사용하는 것이며, 상기 단일 양방향 안정형 루프는 동맥, 나팔관(fallopian tube) 또는 소정의 다른 신체 부위를 소정 시간동안 폐쇄 또는 유지하도록 사용될 수 있다. It is another object of the present invention is to use a two-way stable loop (unit cell) of the single as a clip, the single bi-directional stable loop to the artery, fallopian tubes (fallopian tube), or some other body parts closed or maintained for a predetermined time It can be used. 이런 클립에 있어서, 접혀진 안정 형상이 가장 안정적이여야만 하기 때문에 상기 접혀진 안정 형상이 변형되지 않은 형상으로서 형성되는 것이 바람직하다. In such a clip, it may be formed as a non-deformed shape the folded stable shape, but only be the collapsed stable shape is the most stable. 접혀진 상태에서, 상기 클립은 도 14의 접혀진 팽창 링과 유사하다. In the retracted state, the clip is similar to the folded inflatable ring of Figure 14; 트리거링 수단은 상기 양방향 안정형 루프를 한 상태에서 다른 상태로 변환하도록 클램프와 함께 사용될 수 있다. Triggering means may be used with the clamp so as to convert in a state in which the bi-directional loop to another stable state. 상기 트리거링 수단은 공압적, 유압적, 기계적, 열적 또는 전자기계적 수단일 수 있다. The triggering means may be pneumatically, hydraulically, mechanical, thermal or electro-mechanical means. 이런 트리거링 수단의 예는 양방향 안정형 루프에 힘을 적용하는 사람의 손 및 루프에 열을 적용하는 것을 포함한다. An example of such a triggering device involves the application of heat to the hand of a person and a loop applying a force to the bi-directional loop stable. 다른 트리거링 수단은 상기 장치상의 푸싱 장치, 상기 장치상의 풀링 장치, 상기 장치의 강성 섹션을 굽히는 또는 가요성 부재를 적소에 유지하는 구속력을 해제하는 것을 포함한다. Other triggering means comprises a release binding for holding the pushing device, pulling device, a rigid section, a bending or a flexible member of the device on the device on the device in place. 본 발명의 다른 일부는 본 발명에 따른 하나 이상의 링형 소자 사이에 관형 슬리브가 조합되어 있는 구성을 포함하며, 상기 슬리브는 이런 소자에 의해 보강 또는 개방상태로 유지된다. Other portions of the present invention includes configurations in which the tubular sleeve combination between at least one ring-like element according to the invention, the sleeve is maintained in the open state or the reinforcement by these elements. 일예는 하나 이상의 팽창 링과 함께 폴리머로 제조된 소위 접합 스텐트(graft stent)라 지칭되는 것이다. An example will be referred to as a so-called junction stent (stent graft) made of a polymer in combination with at least one expansion ring. 상기 팽창 링은 상술한 양방향 안정형 셀로 구성될 수 있다. The inflatable ring may be comprised of the above-described two-way stable cells. 상기 스텐트의 표면은 팽창 링상에 장착된 표피(skin)를 포함한다. The surface of the stent comprises the epidermis (skin) mounted on the expansion ringsang. 표피를 장착함에 있어서, 상기 표피는 팽창 링 내부 또는 팽창 링 사이에 둘러싸여질 수 있다. As mounted in the skin, the skin may be surrounded between the expansion ring or expansion ring inside. 상기 표피는 사람 또는 동물의 피부일 수 있고, 폴리머릭 재료(polymeric material)나 소정의 다른 적절한 생체 친화성 재료(bio-compatible material)일 수 있다. The skin may be a human or can be a skin of an animal, and polymeric material (polymeric material) or any other suitable biocompatible material (bio-compatible material). 이런 스텐트는 상기 스텐트의 제 1 단부에서 제 1 팽창 링과, 상기 스텐트의 제 2 단부의 제 2 팽창 링과 같이 하나 이상의 팽창 링을 포함할 수 있다. Such stents may include a first expansion ring and, the at least one expansion ring as shown in the second expansion of the second end of the stent from first end ring of the stent. 상기 스텐트는 그 길이를 따라서 일정한 직경이거나, 제 1 단부에서는 제 1 직경을 가지고, 제 2 단부에서는 제 2 직경을 가질 수 있다. The stent may be a constant diameter along its length, a first end with the first diameter, the second end portion may have a second diameter. 또한, 본 발명은 팽창되지 않은 형상과 팽창된 형상을 가지는 스텐트에 관한 것이며, 상기 스텐트는 제 1 파장을 특징으로 하며, 정점(peak)과 골(trough)을 가지는 복수개의 종방향 제 1 파형 부재와, 제 2 파장을 특징으로 하며, 정점과 골을 가지는 복수개의 종방향 제 2 파형 부재를 포함한다. In addition, the present invention relates to a stent having a non-expanded configuration and an expanded configuration, the stent is characterized by a first wavelength, peak plurality of longitudinal first waveform element having a (peak) and the bone (trough) and, second, and it characterized by a second wavelength, and a plurality of longitudinal second corrugated members having an apex and bone. 상기 제 1 및 제 2 종방향 부재의 파장은 실질적으로 동일하다. The first and second wavelengths of the longitudinal member are substantially the same. 상기 제 2 부재는 안정하게 두가지 위치를 취할 수 있으며, 상기 두가지 위치는 제 1 부재와 제 2 부재의 위상이 동일한 팽창되지 않은 형상에 대응하는 제 1 위치와, 제 1 및 제 2 부재가 서로 180°위상이 상이한 팽창된 형상에 대응하는 제 2 위치이다. The second member may be stably take two positions: a first position in which the two kinds of position corresponds to the first member and the shape claim that the second member phases are not the same expansion of the first and second members 180 to each other ° a second position, the phase corresponding to a different expanded geometry. 제 1 부재는 제 2 부재보다 강성이 강하다. The first member is strong in rigidity than the second member. 상기 제 1 및 제 2 종방향 부재는 종방향 제 1 및 제 2 부재가 교대가 되도록 스텐트의 표면상에 배치된다. The first and second longitudinal members are arranged on the surface of the stent such that the longitudinal first and second members are alternately. 팽창되지 않은 상태에서, 각 제 1 부재의 각 정점은 부착 영역내의 제 2 부재의 하나의 인접한 정점에 연결되고, 각 제 1 부재의 각 골은 부착 영역내의 제 2 부재의 하나의 인접한 골에 연결되며, 이는 도 9에 도시되어 있다. In a non-expanded condition, each vertex of each of the first member is coupled to one of the adjacent vertex of the second member within the attachment zone, each valley of each first member is connected to one adjacent bone of the second member in the attachment section and, as is shown in Fig. 부착 영역은 종방향을 따라 하나의 파장만큼 분리되어 있다. Attach region are separated by one wavelength along the longitudinal direction. 상술된 스텐트는 반경방향 외향력을 적용함으로써 팽창되지 않은 형상으로부터 팽창된 형상으로 스냅될 수 있고, 유사하게, 반경방향 내향력을 적용함으로써 팽창된 형상으로부터 팽창되지 않은 형상으로 스냅될 수 있다. The above-described stents may be snapped into non-expansion from the expanded configuration by applying a radial direction within hyangryeok other by a can be snapped into an expanded shape from a non-expanded configuration, similarly, it applies hyangryeok radial shape. 이러한 스텐트는 신체 혈관의 내부에 사용될 수 있는 동시에, 두 혈관을 함께 결합하도록 혈관 외부에 사용될 수도 있다. This stent is the same time that can be used inside the body vessel, blood vessels may also be used for the outside to engage with the two blood vessels. 또한, 본 발명은 두개의 혈관을 함께 결합하는 방법에 관한 것으로, 상기 방법은 제 1 안정상태에서 팽창되지 않은 형상으로 있는 스텐트를 신체내의 자리로 전달하는 단계와, 상기 스텐트를 제 2 안정 상태로 팽창시키는 단계와, 결합될 혈관상에 스텐트를 위치시키는 단계를 포함하고, 상기 제 2 안정상태에 있는 스텐트의 직경은 결합될 혈관의 직경을 초과한다. The invention also relates to a method for joining together two vessels, the method comprising the steps, and the stent for delivering the stent in a shape not expanded in the first stable state to the place in the body to a second stable state including the step of expanding, comprising: placing a stent in the blood vessel image to be combined, and the diameter of the stent in the second steady-state is greater than the diameter of the blood vessel to be bonded. 상기 스텐트는 그후에, 제 3 안정 상태로 수축될 수 있으며, 상기 제 3 안정 상태의 스텐트는 팽창되지 않은 상태의 스텐트 직경과, 제 2 안정 상태의 스텐트 직경 사이의 중간 직경을 갖는다. The stent is then, in the third stable state, and can be contracted and has a diameter intermediate between the first state of the non-stable state of the third stent is expanded stent diameter, and a second stable state of the stent diameter. 상기 스텐트는 상술한 하나 이상의 팽창 링(양방향 안정형 루프)의 도움으로 혈관에 부가적으로 고정될 수 있다. The stent may be additionally fixed to the vessel with the help of one or more of the above-described expansion ring (bi-directional loop stable). 도 13 및 도 14에 도시된 바와 같은 하나 이상의 팽창 링이나 작은 클램핑 스텐트(도 23에 도시된 스트립으로 형성된 바와 같은)는 스텐트의 각 측면이 수축된 상태로 전달될 수 있으며, 상기 링들 사이에 혈관이 클램핑되도록 전개될 수 있다. 13 and (as formed in the strip shown in FIG. 23), at least one expansion ring and a small clamping stent as shown in Figure 14 is that each side of the stent may be delivered into the contracted state, the blood vessel between the rings It may be deployed such that the clamping. 다수의 링이 부가적인 클램핑을 위해 사용될 수 있다. A plurality of rings may be used for additional clamping. 도 15에 도면 부호 300으로 도시되어 있는 바와 같이, 제 1 혈관(304)과 제 2 혈관(308)은 본 발명의 스텐트(312)로 함께 결합된다. As shown by reference number 300 in Figure 15, the first vessel 304 and second vessel 308 is combined with a stent (312) according to the present invention; 혈관(304)은 제 1 오버랩 영역(316)에서 스텐트상에 오버랩되고, 혈관(308)은 제 2 오버랩 영역(320)에서 상기 스텐트상에 오버랩된다. Vessel 304 is overlapped onto the stent in a first overlapping region 316, the vessel 308 is overlapped onto the stent in a second overlap area (320). 혈관(304)은 팽창 링(324; 팽창된 상태로 도시되어 있음)과 스텐트(312) 사이에 클램프되고, 혈관(308)은 팽창 링(328; 단지 예시의 목적을 위해 팽창되지 않은 상태로 도시되어 있음)과 스텐트(312) 사이에서 클램프된다. Blood vessel 304 expands the ring (324; shown in the expanded condition that) and being clamped between the stent 312, the vessel 308 is expanded ring (328; shown in a state that is not only expanded for purposes of illustration It is clamped between the Yes) and the stent (312). 팽창 링(328)과 조합된 점선은 팽창된 상태의 팽창 링(328)을 도시한다. In combination with the expansion ring 328. The dotted line illustrates the expansion of the expanded ring state 328. 도 15는 내부에 포함된 링을 도시하는 혈관의 절개도이다. Figure 15 is a section of a blood vessel showing the ring contained therein. 도 16은 도 15의 16-16선을 따른 단면도를 도시하고 있다. 16 shows a cross-sectional view taken along the line 16-16 of Figure 15. 혈관(304)은 스텐트(312)와 팽창 링(324) 사이에 끼워진 상태로 도시되어 있다. Blood vessel 304 is shown in a state sandwiched between the stent 312 and the expansion ring 324. 다른 실시예에 있어서, 도 17에 도시된 바와 같이, 제 1 혈관(404)과 제 2 혈관(408)은 스텐트(412)에 의해 함께 결합된다. In another embodiment, as shown in Figure 17, the first vessel 404 and second vessel 408 are coupled together by a stent 412. 스텐트(412)의 제 1 단부(416)는 혈관(404)내에 위치되고, 스텐트(412)의 제 2 단부(420)는 혈관(408)내에 위치된다. The first end 416 is located within the blood vessel 404, the second end 420 of the stent 412, the stent 412 is located within blood vessel 408. The 혈관(404, 408)의 외측에 위치된 선택적인 클램프(424, 428; 도 23에 스트립형상으로 도시된 본 발명의 접을 수 있는 스텐트의 작은 부분 등)는 상기 스텐트를 상기 혈관에 클램핑한다. Vessels (404, 408), the optional clamping position on the outside of the (424, 428; a small portion of the collapsible stent of the present invention shown in Figure 23, a strip shape, and the like) is clamped to the stent in the vessel. 부가적인 클램프가 필요에 따라 사용될 수 있다. An additional clamp may be used, if necessary. 다른 실시예에 있어서, 도 15의 실시예와 도 17의 실시예의 조합으로써, 스텐트의 제 1 단부는 상기 혈관 중 하나로부터 돌출되고, 상기 스텐트의 제 2 단부는 상기 제 2 혈관 위로 연장될 수 있다. In another embodiment, as an embodiment a combination of Figure 15 embodiment and FIG. 17, the first end of the stent protrudes from one of said vessels, a second end of the stent may extend over the second vessel . 또한, 클램프 및 팽창 링은 상기 스텐트를 상기 혈관에 부가적으로 결합하기 위해 사용될 수 있다. In addition, the clamping ring and the expansion can be used to join the stent to the blood vessel additionally. 도 18에 도시된 바와 같이, 본 발명의 다른 실시예에 있어서, 혈관(454) 및 혈관(458)은 혈관 내부의 팽창 링(462)과 예로서, 작은 접혀질 수 있는 스텐트 부분으로 구성된 클램프(466)로 함께 유지되고, 상기 스텐트는 접혀진 상태에서 스텐트의 직경이 혈관(454, 458)과 팽창 링(462)을 함께 안착시킬 수 있도록 선택된다. As shown in Figure 18, according to another embodiment of this invention, the blood vessel 454 and vessel 458 is the clamp consisting of a stent portion which can be, small folded as internal expansion ring 462 and the example of the blood vessel ( and held together by 466), the stent is the diameter of the stent in the collapsed state is selected to be mounted with the vessel (454, 458) and an expansion ring (462). 팽창 링 또는 클램프 중 하나는 강성 칼라 등의 적절한 지지부로 대체될 수 있으나, 양자 모두가 대체될 수는 없다. One of the expansion ring or a clamp may be replaced by a suitable support, such as a rigid collar, but both can not both be an alternative. 또한, 본 발명은 두개의 혈관을 함께 접합하는 방법에 관한 것으로, 상기 방법은 신체의 위치에 제 1 안정 상태의 팽창되지 않은 형상의 본 발명의 스텐트를 전달하는 단계와, 상기 스텐트 위에 두개의 신체 혈관을 위치시키는 단계및, 상기 스텐트를 제 2 안정 상태로 팽창시키는 단계를 포함하고, 제 2 안정 상태에서 상기 스텐트의 직경은 결합될 혈관의 직경보다 크다. The invention also relates to a method for joining together two vessels, the method comprising: passing a first steady-state non-expanded stent of the present invention the shape of the body position, the two bodies over the stent the diameter of the stent comprises the step of expanding the steps and, the stent for a blood vessel located in the second stable state, and in the second stable state is larger than the diameter of the blood vessel to be bonded. 제 2 안정 상태에서 상기 스텐트의 직경은 스텐트 위에 상기 혈관을 안착시킬 수 있도록 선택되는 것이 바람직하다. The second diameter of the stent in the stable state is preferably selected so as to seat the blood vessel over the stent. 상기 스텐트의 전달은 상기 신체 혈관을 통해 팽창되지 않은 형상의 스텐트를 전달하고, 이어서 상기 스텐트를 결합될 혈관 내에 안착되도록 팽창시키거나(스텐트의 일부가 혈관내에 존재하게 된다), 스텐트를 그 최대 팽창 상태로 팽창시켜서, 상기 혈관 위에 상기 스텐트를 위치시킨 후 상기 혈관 위에서 중간 상태로 상기 스텐트를 수축시킴으로써 달성될 수 있다. Delivery of the stent delivers the stent in the non-expanded configuration through the body vessel, and then to expansion to be seated within the blood vessel to be coupled to the stent, or (a portion of the stent that is present in the blood vessels), the stent its maximum expansion by expansion in a state after placing the stent on the vessel it can be accomplished by contracting the stent to an intermediate state on the vessel. 상술한 칼라와 팽창 링은 유사하게 전달될 수 있다. Above the collar and the inflatable ring it may be similarly delivered. 또한, 상기 스텐트, 칼라 및 팽창 링은 수술에 의해 상기 혈관을 노출시킴으로서 전달될 수도 있다. Further, the stent, and expansion collar ring may also be delivered by the operation of the blood vessel sikimeuroseo exposure. 또한, 본 발명은 양방향 안정형 밸브에 관한 것이다. The present invention also relates to a stable two-way valve. 도 19에 도면부호 600으로 도시되어 있는 상기 밸브는 도관(606)내에 위치되어 있는 도면 부호 604로 도시된 스냅-작용 양방향 위치형 유니트 셀을 포함한다. The valve illustrated in Figure 19 by reference number 600 is a snap shown by reference numeral 604 which is located within a conduit (606) comprises a two-way working position type unit cell. 스냅 작용 양방향 위치형 유니트 셀(604)은 제 1 단부(612)와 제 2 단부(616)를 구비한 가요성 부재(608; 실질적으로 아치형임)를 포함한다. Snap action bi-directional position type unit cell 604 has a first end 612 and a flexible member having a second end (616); and a (608 being substantially arcuately). 제 1 단부(612)는 도관(606)의 내면으로부터 연장되어나오는 지지 수단(624)에 의해 순차적으로 지지되게 되는 트리거링 수단(triggering means)(620)과 소통된다. The first end 612 is in communication with the triggering means (triggering means) (620) that is to be supported successively by the support means (624) extending out from the inner surface of the conduit 606. The 가요성 부재(608)의 제 2 단부(616)는 도관(606)을 가로질러 연장되는 정지면(628)에 고정된다. The second end 616 of flexible member 608 is fixed to the stopper surface 628 extending across a conduit 606. The 지지 수단(624)과 정지면(628)은 가요성 부재(608)를 적소에 유지하도록 충분히 강성적이어야만 하고, 가요성 부재(608)보다 더 강성적이어야만 한다. Support means 624 and stop surface 628 will be a more rigid than the flexible member must be a sufficiently rigid to hold the 608 in place, the flexible member 608. 정지면(628)은 경사 영역(630)에서 도관(606)을 실질적으로 경사지게 가로질러 연장하고, 유체가 그를 통해 유동하게 되는 종방향 영역(634)내의 개구를 갖는다. Stop surface 628 has an opening in the inclined area 630 substantially obliquely extend across, and the longitudinal area 634 is in fluid from flowing therethrough to conduit 606 at. 개구(632)는 도관(606)의 종축(636)을 따라서 배향하고 있지만, 본 기술 분야의 숙련자들은 개구 및 정지면의 다른 배향이 가능하다는 것을 알 수 있을 것이다. Opening 632. Although the alignment along the longitudinal axis 636 of the conduit 606, those skilled in the art will recognize that other possible orientation of the opening and the stop surfaces. 개방 위치와 폐쇄 위치 사이에서 가요성 부재(608)에 의해 작동되는 밸브 폐쇄 부재(640)는 가요성 부재(608)가 폐쇄 위치에 있을 때에 개구(632)를 통해서 유체가 유동하는 것을 방지하도록 배열 및 구성된다. An open position and arranged closing member 640 is a flexible member 608 that is operated by a flexible member 608, between a closed position to prevent the fluid through the opening 632, the flow when in the closed position and it is configured. 도 20에 도시된 바와 같이, 가요성 부재(608)가 개방 위치에 있을 때에, 밸브 폐쇄 부재(640)는 더이상 개구(632)를 막지 않으며, 따라서 유체가 그를 통해 유동하게 된다. As it is shown in Figure 20, when the flexible member 608 in an open position, the valve closing member (640) does not block the longer the opening 632, and thus the fluid is allowed to flow therethrough. 트리거링 수단(620)은 현재 또는 미래의 기술 분야에 공지되어 있는 소정의 적절한 기계적, 유압적, 공압적 또는 열적인(thermal) 트리거일 수 있지만, 본 발명의 양호한 실시예에서는 상기 트리거 수단(620)은 압전 소자(piezoelectric element)이다. Triggering means 620 can be a current, or any suitable mechanical as is known in the art in the future, hydraulically, pneumatically or thermal (thermal) triggers, in preferred embodiments of the present invention, the trigger means 620 It is a piezoelectric element (piezoelectric element). 작동시에, 도 19에 도면부호 620으로 도시되어 있는 압전소자가 작동되지 않으면, 밸브 폐쇄 부재(640)는 폐쇄된다. If during operation, the reference numeral 19 is shown as a piezoelectric element 620 is not in operation, the valve closure member 640 is closed. 도 20에 도시된 바와 같이, 압전소자(620)가 작동되면, 압전소자(620)의 종방향 길이(도 15에 Y로 도시되어 있다)가 조금 짧아지게되고, 순차적으로 가요성 부재(608)를 그 제 1 위치로부터 해제하게 된다. The piezoelectric element 620 when the work (shown by Y in FIG. 15) the longitudinal length of the piezoelectric element 620 becomes a little shorter, the flexible member 608, sequentially, as shown in Figure 20 a is released from the first position. 부재(608)가 해제되면, 밸브 폐쇄 부재(640)는 유체로부터 전달되는 압력하에 자유롭게 개방되게 된다. When the member 608 is released, the valve closure member 640 is free to be opened under the pressure is passed from the fluid. 부재(608)는 도 20에 도시된 바와 같이 제 2의 반전된 위치(inverted position)를 취하게 된다. Member 608 is place in the inverted position of the 2 (inverted position) as shown in Figure 20. 유체 압력이 부재(608)를 그 제 2 위치에서 유지하면서, 상기 트리거링이 꺼지고 압전 소자(620)가 그 원래의 길이를 취하고 있다면 상기 부재(608)는 유체의 압력이 없어도 도 20에 도시된 바와 같이 그 제 2 위치에 남아있게 된다. Fluid pressure member 608, the bar while maintaining in the second position, wherein the trigger is turned off and the piezoelectric element 620 is shown in the member 608, Figure 20 without the pressure of the fluid, if taking its original length as it will remain in its second position. 밸브 폐쇄 부재(640)는 압전 소자가 다시 트리거링되어 상기 부재(608)를 상기 부재(608)의 선택된 위치인 그 제 1 위치(폐쇄 위치)로 전이시키게됨으로써 유체가 없어도 다시 폐쇄 위치가 될 수 있다. The valve closure member 640 by being the piezoelectric elements are activated again, thereby spread to the first position (closed position), the selected position of the member 608, the member 608 without the fluid can be re-closed position . 부재(608)는 도 3에 도시된 바와 같은 선택된 위치를 취하도록 처리되게 된다. Member 608 is to be processed to take a selected position as shown in Fig. 도 19 및 도 20에 도시된 밸브는 의료용 장치나 비의료용 장치에 적용될 수있다. 19 and the valve shown in Fig. 20 can be applied to medical apparatus or non-medical devices. 특히, 본 발명의 목적은 본 발명의 양방향 안정형 밸브를 요실금의 제어에 적용하는 것이다. In particular, it is an object of the invention to apply the stable two-way valve of the present invention to the control of urinary incontinence. 요실금 환자들에 있어서, 상술한 밸브는 상술한 팽창 링의 사용을 포함하는 상기 밸브를 요도에 클램프하는 소정의 적절한 수단을 사용하여 요도내에 설치될 수 있다. In patients with incontinence, the above-mentioned valve may be provided in the urethra using any suitable means to clamp the urethra, said valve including the use of the above-described expansion ring. 디폴트 상태(default state)의 상기 밸브는 폐쇄되어 있지만, 방광이 가득차게 되었을 때 방광을 비우기 위해 트리거될 수 있다. Although the valve is closed in its default state (default state), it may be triggered to empty the bladder when the bladder is filled. 방광을 비운후 상기 밸브는 다시 폐쇄위치로 트리거될 수 있다. After emptying the bladder, the valve may be triggered back to the close position. 이런 응용의 다른 예는 본 발명의 밸브를 분로(shunt)와 관련하여 사용하는 것이다. Other examples of this application is to use in connection with the valve of the present invention and the shunt (shunt). 상기 분로는 상기 장치를 트리거링함에 의해 작동될 수 있고, 유사하게 상기 장치를 트리거링함에 의해 폐쇄될 수 있다. The shunt can be operated By triggering the device, and can be similarly By triggering the apparatus closing. 물론, 상기 밸브는 다른 의료용 및 비 의료용 응용분야에도 사용될 수 있다. Of course, the valve can also be used for other medical and non-medical applications. 상술한 양방향 안정형 유니트 셀에 부가하여, 다른 형상의 양방향 안정형 유니트 셀과, 보다 일반적인 다중 안정형 유니트 셀도 본 발명에서 고려될 수 있다. In addition to the two-way stable unit cell described above, may also be considered in the present invention two-way stable unit cell, the more general multi-stable unit cell of a different shape. 도 21a 및 도 21b는 본 발명의 힌지형 다중 안정형 셀의 다른 실시예를 그 수축된 상태와 팽창된 상태로 각각 도시하고 있는 개략적인 도면이다. Figure 21a and Figure 21b is a schematic view, each of which shows another embodiment of a hinge-like multi-stable cell of the present invention to that of the contracted state and the expanded state. 도면부호 700으로 도시된 수축된 셀과, 도면 부호 705로 도시된 팽창된 셀은 네개의 상호연결된 상대적인 강성 부재로 구성되어 있다. Reference numeral 700 of the illustrated in the contracted cells and a reference numeral 705 shown in inflated cells is composed of four mutually relatively rigid members are connected. 2개의 측면 부재(709)는 힌지(715)를 경유하여 상단부 부재(713)의 대향 단부에 연결되어 있다. Two side members 709 are connected via a hinge 715 to the opposite end of the upper member 713. 측면 부재(709)는 그 대향 단부에서 힌지(719)를 경유하여 저면 부재(717)의 대향 단부에 연결되어 있다. Side member 709 is via a hinge 719 at its opposite ends connected to opposite ends of the bottom member 717. 상기 힌지는 탄성 또는 소성변형될수 있는 것이 바람직하다. The hinge is preferably that can be elastic or plastic deformation. 상기 힌지는 측면, 상단부 및 저단부 부재에 견고하게 부착될 수 있거나, 상기 부재들과 일체로 형성될 수 있다. The hinge may be solidly attached to the side, top and bottom end member, may be formed of the members and the body. 후자의 경우에 있어서, 상기 힌지는 이 힌지가 상기 측면, 상단부 및 저단부 부재와 상이한 기하학적 형상을 갖거나 더 얇아지도록 힌지의 영역에서 셀로부터 재료를 제거함으로써 형성될 수 있다. In the latter case, the hinge may be formed by in the region of the hinge is the side, such that the hinge or has a thinner top and bottom end members and the different geometric shape removing material from the cell. 팽창된 상태로부터 접혀진 상태로의 전이 과정(transitioning)에 있어서, 상기 저단부 부재(717)는 다소 개방된다. In the transition (transitioning) to the retracted state from the expanded state, the bottom end member 717 is slightly open. 또한, 도 21a 및 도 21b의 셀은 측면 부재(709)와 상단부 부재(713) 중 하나 또는 나머지 하나(양자 모두는 아님)가 하향으로 접혀지는 두개의 부가적인 중간 상태를 가진다. Further, the cell of Figure 21a and 21b also have two additional intermediate state folded to the side members 709 and upper member 713, one or the other (but not both) of the downlink. 육각 힌지형 다중 안정형 유니트 셀이 도 22a에서는 접혀진 상태로, 도 22b에서는 팽창된 상태로 개략적으로 도시되어 있다. The hex-shaped multi-stable hinge unit cells Figure 22a to the retracted state, is schematically illustrated in an expanded state, Fig. 22b. 도면부호 750으로 도시되어 있는 셀은 상단부 부재(754)와 저단부 부재(758) 및 상부 측면 부재(762)로 구성되어 있다. The cell to which it is shown by the numeral 750 is composed of an upper end member 754 and a bottom end member 758 and the upper side members 762. 두개의 상부 측면 부재(762)는 힌지(756)를 경유하여 상단부 부재(754)의 대향 단부에 연결되어 있다. Two upper side members 762, is by way of the hinge 756 connected to the opposite ends of the upper member 754. 상부 측면 부재(762)는 힌지(768)를 경유하여 저단부 부재(758)에 연결되어 있다. The upper side member 762 is connected to the bottom end member 758 via a hinge (768). 저단부 부재(758)는 두 직립부가 'U'의 저단부에 대하여 경사지게 놓이도록 되어 있는 변형된 'U' 형상이다. Bottom end member 758 is a two upright added 'U' shape so that strain that is placed obliquely with respect to the bottom end of the 'U'. 상술한 본 발명의 셀에서와 같이, 힌지(756, 758)는 탄성 또는 소성 변형 가능하며, 상기 부재에 견고하게 부착되거나 상기 부재와 일체로 형성될 수 있다. As in the cell of the invention as described above, it is an elastic or plastic deformation of the hinge (756, 758) and, or fixedly attached to said member may be formed of the member and the body. 상기 육각형 유니트 셀은 다중 안정 상태를 갖는다. The hexagonal unit cell has multiple stable states. 도 22a 및 22b에 도시되어 있는 완전히 팽창된 상태와 완전히 수축된 위치에 부가하여, 상기 육각형 셀은 두 개의 상부측면 부재(762) 중 하나만이 상단부 부재(754)를 따라서 내향으로 접혀져 있는 두개의 중간 안정 형상을 취할 수 있다. In addition to the fully retracted position and a fully expanded position shown in Figure 22a and 22b, wherein the hexagonal cell has two middle two only one of the upper side members 762 folded inwardly along the upper end member 754 It can take the shape stability. 상술한 힌지형 다중 안정형 셀은 예로서, 스텐트, 클램프, 클립, 팽창 링, 양방향 안정형 밸브를 형성하는 상술한 응용 분야에 사용될 수 있다. A hinge-like multi-stable cells described above can be used in the aforementioned applications, which by way of example, forming the stent, clamp, clip, ring expansion, stable two-way valve. 이런 응용 분야중 하나에 있어서, 도 21a 및 도 21b에 도시된 힌지형 셀로 스텐트나 링을 형성한다. In one such application, to form a hinge-like cells or stent ring shown in Fig. 21a and Fig. 21b. 도 23에 도시된 바와 같이, 도 21a 및 도 21b에 도시된 형태의 일련의 유니트 셀은 셀의 상단부 부재가 인접한 셀의 저면부를 형성하도록 함께 결합된다. As shown in Figure 23, a series of unit cells of the type illustrated in Figure 21a and 21b are joined together to form a bottom surface of the cell is an upper end member of an adjacent cell. 도시된 바와 같이, 셀(810)의 상단부 부재(814)는 셀(820)의 저단부 소자(818)의 일부를 형성한다. As shown, the upper member 814 of the cell 810 forms a part of the bottom end element 818 of the cell 820. 이와 유사하게, 셀(828)의 상단부 부재(824)는 셀(836)의 하부 부재(848)의 일부를 형성한다. Similarly, upper end member 824 of the cell 828 forms a portion of the lower member 848 of the cell 836. 도 23의 링 또는 스텐트가 예시를 위해 절단되어 있지만, 두 단부(840, 844)는 일반적으로 셀(852)의 하부 부재(848)의 일부가 셀(856)의 상부 부재로서 작용하는 상태로 함께 결합되어 있다. Although the ring or the stent of Figure 23 is cut for purposes of illustration, the two ends (840, 844) are typically together in a state where a portion of the lower member 848 of the cell 852, which serves as a top member of the cell (856) It is coupled. 결과적으로 형성된 링은 완전히 팽창된 상태와, 완전히 수축된 상태를 포함하는 소정 범위의 안정 상태를 가지고 있다. As a result, the ring formed by has a stable state in a predetermined range including a fully expanded state, and a fully contracted state. 개별적인 셀이 동일하게 만들어지는 경우에, 완전히 수축된 상태의 스텐트에 균일한 반경방향 외향력을 적용하면 단지 완전히 팽창된 상태만을 얻을 수 있다. If the individual cells are made equal to, application of a radially outer hyangryeok uniform in stent in a fully contracted state can be obtained only a fully expanded state. 이는 클램프나 칼라, 팽창 링이나 스텐트로서 기능할 수 있다. Which it can function as a clamp or collar, the expansion ring and the stent. 보다 큰 스텐트는 이런 링을 복수개 상호 연결함으로써 형성될 수 있다. The larger the stent may be formed by a plurality of interconnecting this ring. 또한, 다른 다중 안정형 유니트 셀로부터도 유사한 생산품을 형성할 수 있다. Further, it is possible to form a similar product is also different from the multi-stable cell unit. 도 24a 및 도 24b는 도 22a 및 도 22b에 도시된 바와 같은 육각 유니트 셀이 링을 형성하도록 함께 결합되어 있는 일예를 개략적으로 도시하고 있다. Figure 24a and Figure 24b is a schematic diagram showing an example which is bonded together to form a hexagonal unit cell, the ring as shown in Figure 22a and Figure 22b. 각 셀(880)의 상단부 부재(884)는 'U'형 저단부 부재(890) 또는 저단부(886)과 결합된다. An upper end member 884 of each cell 880 is engaged with the 'U' shaped bottom end member 890 or the bottom end (886). 도 24a 및 도 24b에서는 스트립 형태로 도시되어 있지만, 단부(894)는 링을 형성하도록 단부(898)와 결합될 수 있다. Although illustrated in strip form in Fig. 24a and 24b, the ends 894 may be coupled with the end (898) to form a ring. 도 24a의 스트립은 도 24b에 완전히 팽창된 상태로 도시되어 있다. Strip of Figure 24a is shown in a fully inflated state in Fig. 24b. 인접한 셀(880)은 팽창된 상태로 도시된다. Adjacent cell 880 is shown in an expanded state. 완전성을 위해 힌지가 도면 부호 902로 도시되어 있다. There hinge is shown at 902. For completeness. 도 24c는 팽창 과정의 셀(920)과 이미 팽창된 셀(924)을 도시한다. Figure 24c shows an already inflated and cell 920 in the cell expansion process (924). 상기 셀(920, 924)은 저단부 부재(928)와 상단부 부재(932)에서 결합되어 있다. The cells (920, 924) are coupled in a bottom end member 928 and the upper end member 932. 힌지는 도면부호 936으로 도시되어 있다. Hinge is shown by reference numeral 936. 다수의 스트립이 함께 결합되어서 상기 유니트 셀의 길이의 배수의 길이를 갖는 스텐트를 형성할 수 있다. Be a plurality of strips joined together to form the stent has a length of a multiple of the length of the unit cell. 이 경우에 있어서, 인접한 셀의 상부측면 부재는 함께 결합되어야 한다. In this case, the upper side member of the adjacent cell is to be bonded together. 이는 도 24d에 도시되어 있으며, 상기 도 24c에서는 팽창 과정의 셀(944)과 팽창된 상태의 셀(940)이 도시되어 있다. This also is shown in 24d, 24c in the Figure has a cell 944 and a cell 940 in the expanded state of the expansion process are shown. 상부 측면 부재(948)는 점선으로 도시되어 있다. The upper side member 948 is shown as a dashed line. 상호연결된 셀(952)의 인접한 스트립은 저단부 부재(960)의 경사 영역(956)은 물론 상부 측면 부재(948)에 의해 결합되어 있다. Inclined area 956 of the mutually adjacent strips of the associated cell (952) is a bottom end member 960, as well as are engaged by the upper side members 948. 본 출원의 발명된 장치는 체내에서 일시적인 근거지나 영구적인 근거지상에 사용될 수 있다. The apparatus aspect of the invention may be used in a temporary basis through a permanent basis in the body surface. 따라서, 제거형 스텐트 및 클램프와 마찬가지로 예로서 영구적인 스텐트와 클램프도 고려될 수 있다. Thus, by way of example as in the removal-type stent, and clamps, it can also be considered a permanent stent with a clamp. 본 발명의 다중 안정형 셀의 팽창에 있어서, 셀을 팽창시키도록 적용되는 힘의 방향에 수직인 방향의 팽창/수축의 성분도 있을 수 있다. In the expansion of the multi-stable cell of the present invention, there may be component of the expansion / contraction in the direction perpendicular to the direction of force applied to expand the cells. 마지막으로, 본 출원의 목적을 위하여, '다중 안정형'이라는 용어는 '양방향 안정형'을 포함하는 것이다. Finally, for the purposes of this application, the term "multi-stable" is to include "two-way stable. 상술한 도면 및 상세한 설명은 실행될 수 있는 단지 몇몇의 상이한 실시예를 예시하는 것이다. The aforementioned drawings and detailed description is to illustrate only some of the different embodiments that can be performed. 본 발명의 스텐트는 종래의 스텐트와 외관상 유사해보이지만, 동일한 유니트 셀내의 강성 섹션과 가요성 섹션의 특정 조합으로 인해 기계적 결과는 완전히 상이하다. The stent of the present invention results due to mechanical but it apparently similar to the conventional stent, a particular combination of the rigid section and the flexible section in the same unit cell are completely different. 물론, 도시된 사인곡선 형상외에도 동일한 특성 거동을 가지면서 기본 형상이 다른 유니트 셀을 형성할 수도 있다. Of course, in addition to the illustrated sinusoidal shape while having the same characteristic behavior may be a basic shape to form the other unit cell. 상술한 본 발명의 일반적인 원리와 상세한 설명으로부터 본 기술 분야의 숙련자들은 본 발명이 적용된 다양한 변용을 고안할 수 있을 것이다. Those skilled in the art from the general principles and detailed description of the present invention described above will be able to devise various transformation to which the invention is applied. 본 발명의 적용 범위는 상술한 실시예에 예시된 바와 동일한 기본 기계적 거동을 얻도록 하나 이상의 재료의 상이한 조합과, 상이한 구성 및 상이한 기하학적 형상을 포함한다. The range of applications of the present invention include different combinations and different configurations and different geometric shapes of one or more materials to achieve the same basic mechanical behavior as illustrated in the above-described embodiment. 상기 다수의 셀(64)의 각 하나는 안정된 수축 형상(50) 또는 안정된 팽창 형상(60)만을 취할 수(assuming)있는 것을 특징으로 하는 통로를 지지하기 위한 팽창형 장치. Each one of said plurality of cells (64) is expansible device for supporting the passage, it characterized in that that (assuming) take only stable constricted shape 50 or the stable expanded configuration (60). 제 1 항에 있어서, 다수의 셀(64)의 각 하나는 안정된 수축형상(50) 또는 안정된 팽창 형상(60)만을 등온식으로(isothermally) 취할 수 있는 통로를 지지하기 위한 팽창형 장치. The method of claim 1, wherein each one of the plurality of cells 64 is expansible device for supporting a passage that only the isotherm (isothermally) to take a stable contraction shape 50 or the stable expanded configuration (60). 제 1 항에 있어서, 상기 셀(64)이 팽창형 장치(50,60)의 내부면에 균일한 반경방향 힘을 적용시킴으로써 2개의 안정된 형상(50,60)사이에서 전이될 수 있도록 상기 복수의 셀(64)이 구성되고 정렬되는 통로를 지지하기 위한 팽창형 장치. The method of claim 1, wherein the plurality of the cells by 64 to apply a radial force uniformly to the inner surface of the expansible device 50 and 60 2 to be a transition between two stable shape (50 and 60) expansible device for supporting the passage is configured and arranged cells (64). 제 1 항에 있어서, 상기 다수의 셀의 제 1 서브세트(subset)는 제 1 강성을 나타내는 제 2 섹션을 포함하고, 상기 다수의 셀의 제 2 서브세트는 제 2 강성을 나타내는 제 2 섹션을 포함하며, 여기에서 상기 제 1 강성은 제 2 강성과는 다른 통로를 지지하기 위한 팽창형 장치. The method of claim 1, wherein the first subset (subset) is a second subset of the plurality of cells, and a second section that represents the first rigidity of the plurality of cells is a second section representing the second stiffness and including, the first rigid herein expansible device for supporting the other passageway and the rigid. 상기 다수의 셀(64)은 안정된 수축 형상(50)과 연속적이며 분리된 안정 팽창형 형상(60)사이에서 전이될 때에 탄성 변형을 겪게되는 것을 특징으로 하는 통로를 지지하기 위한 팽창형 장치. Cell 64 has a plurality of the expansible device for supporting the passage characterized in that undergoes elastic deformation when the transition between the stable constricted shape (50) and the continuous and stable separation expansible shape (60). 제 5 항에 있어서, 다수의 셀(64)중의 각 하나는 상기 안정된 수축 형상(50)과, 연속적이며 안정된 팽창 형상(60)사이에서 등온식으로 전이할 수 있는 통로를 지지하기 위한 팽창형 장치. The method of claim 5, wherein each one of the plurality of cells 64 is expansible device for supporting to transfer the isotherm between the stable constricted shape (50) and, continuous and stable expanded configuration (60) passage. 제 5 항에 있어서, 상기 셀(64)이 상기 팽창형 장치(50,60)의 내부면에 균일한 반경방향 힘을 적용시킴으로써 2개의 안정된 형상(50,60)사이에서 전이될 수 있도록, 상기 다수의 셀(64)로 구성되고 정렬되는 통로를 지지하기 위한 팽창형 장치. 6. The method of claim 5, by the cell 64 is applied to a uniform radial force on the interior surface of the expandable device 50 and 60 to be transitioned between the two stable shapes 50 and 60, the expansible device for supporting a plurality of passageways constructed and arranged in the cell 64. 제 5 항에 있어서, 상기 다수의 셀(64)의 각 하나는 평형 중앙위치와, 상기 평형 중앙위치 주위의 비대칭 힘-변위 특성을 가지며, 상기 팽창 형상(60)은 각 셀(64)의 가장 안정된 형상인 통로를 지지하기 위한 팽창형 장치. The method of claim 5, wherein each one of the plurality of cell 64 is balanced central position and the asymmetric force around the equilibrium center position - has a displacement characteristics, the expanded configuration 60 is the most of each cell (64) expansible device for supporting a stable shape of the passageway. 제 5 항에 있어서, 상기 다수의 셀(64)의 각 하나는 평형 중앙 위치와, 상기 평형 중앙위치 주위의 비대칭 힘-변위 특성을 가지며, 상기 수축 형상(50)은 각 셀(64)의 가장 안정된 형상인 통로를 지지하기 위한 팽창형 장치. The method of claim 5, wherein each one of the plurality of cell 64 is balanced central position and the asymmetric force around the equilibrium center position - has a displacement characteristics, the constricted shape 50 is most of the individual cells (64) expansible device for supporting a stable shape of the passageway. 제 5 항에 있어서, 상기 다수의 셀의 제 1 서브세트는 제 1 강성을 나타내는 제 2 섹션을 포함하고, 상기 다수의 셀의 제 2 서브세트는 제 2 강성을 나타내는 제 2 섹션을 포함하며, 상기 제 1 강성은 제 2 강성과는 다른 통로를 지지하기 위한 팽창형 장치. The method of claim 5, wherein the first subset of the plurality of cells, a second subset of the plurality of cells, and a second section that represents a first stiffness and a second section that represents a second stiffness, wherein the first stiffness is expansible device for supporting the other passageway and the rigid.